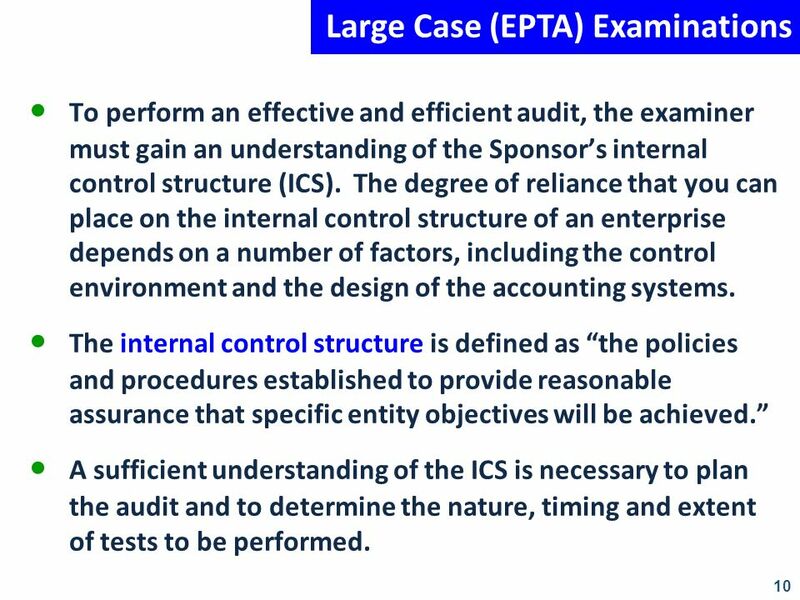 •	To perform an effective and efficient audit, the examiner must gain an understanding of the Sponsor’s internal control structure (ICS). The degree of reliance that you can place on the internal control structure of an enterprise depends on a number of factors, including the control environment and the design of the accounting systems. 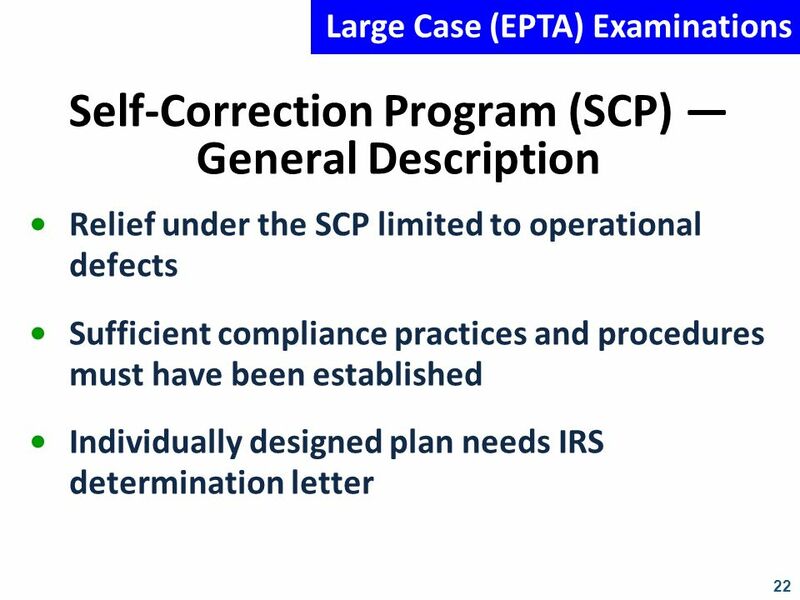 • The internal control structure is defined as “the policies and procedures established to provide reasonable assurance that specific entity objectives will be achieved.” • A sufficient understanding of the ICS is necessary to plan the audit and to determine the nature, timing and extent of tests to be performed. •	The internal control structure includes a Sponsor’s control environment, accounting system and specific control procedures. 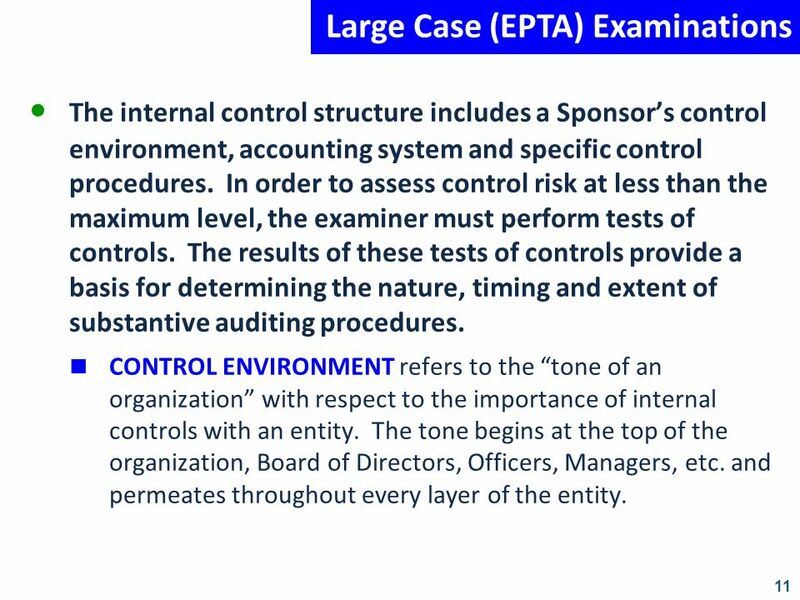 In order to assess control risk at less than the maximum level, the examiner must perform tests of controls. 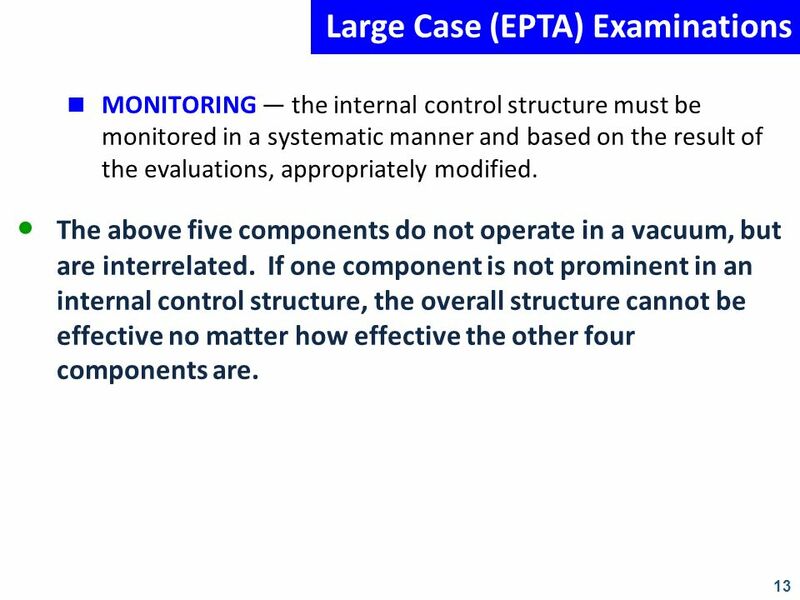 The results of these tests of controls provide a basis for determining the nature, timing and extent of substantive auditing procedures.  CONTROL ENVIRONMENT refers to the “tone of an organization” with respect to the importance of internal controls with an entity. The tone begins at the top of the organization, Board of Directors, Officers, Managers, etc. and permeates throughout every layer of the entity. 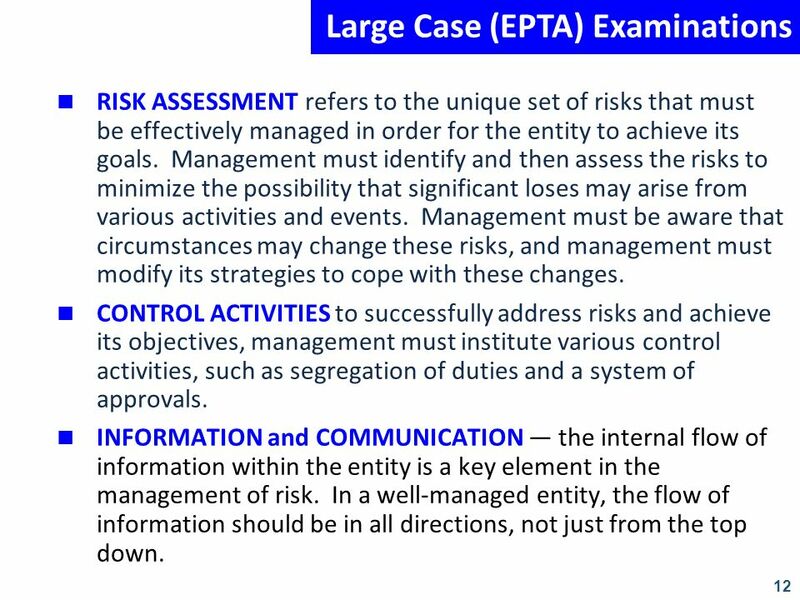  RISK ASSESSMENT refers to the unique set of risks that must be effectively managed in order for the entity to achieve its goals. Management must identify and then assess the risks to minimize the possibility that significant loses may arise from various activities and events. Management must be aware that circumstances may change these risks, and management must modify its strategies to cope with these changes.  CONTROL ACTIVITIES to successfully address risks and achieve its objectives, management must institute various control activities, such as segregation of duties and a system of approvals.  INFORMATION and COMMUNICATION — the internal flow of information within the entity is a key element in the management of risk. In a well-managed entity, the flow of information should be in all directions, not just from the top down.  MONITORING — the internal control structure must be monitored in a systematic manner and based on the result of the evaluations, appropriately modified. • The above five components do not operate in a vacuum, but are interrelated. If one component is not prominent in an internal control structure, the overall structure cannot be effective no matter how effective the other four components are. 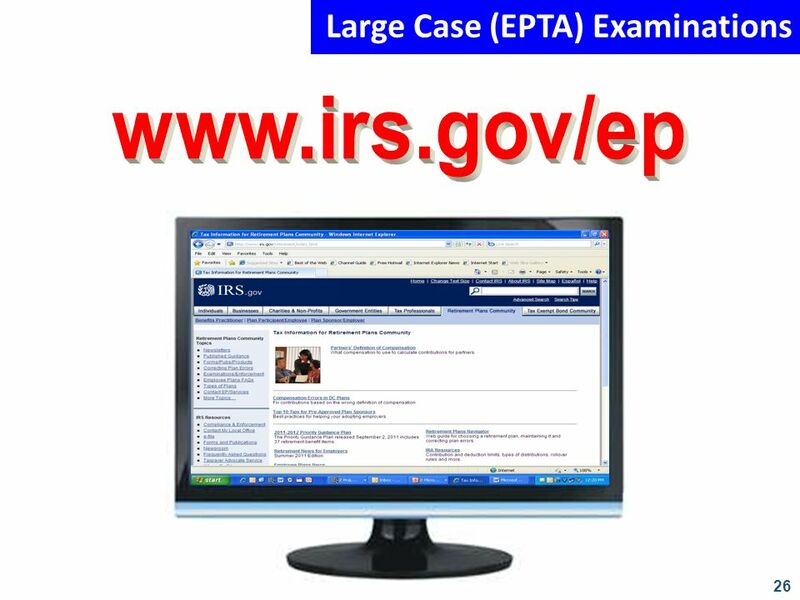 Large Case (EPTA) Examinations Visit the EPTA Webpage IRS Employee Plans Programs Determinations Educational Services Employee Plans Compliance Resolution System (EPCRS) Self-Correction Program Voluntary Correction Program Audit Closing Agreement Program EP Customer Account Services EP Abusive Tax Transactions Examinations/Enforcement Compliance Programs/Initiatives Large Case – Employee Plans Team Audit (EPTA) EP Compliance Unit (EPCU) Retirement Plans Community Plans and Programs Wish to go directly to a plan type or IRS Employee Plans program? Find it here. 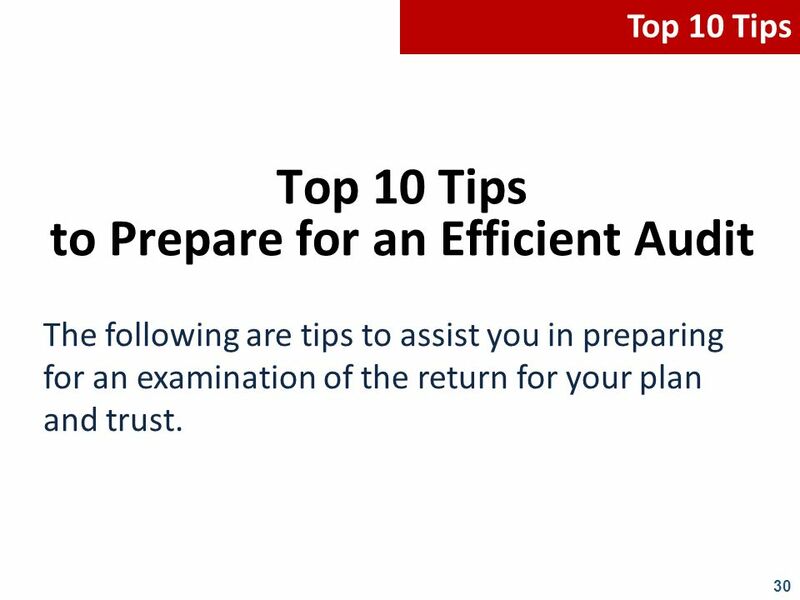 The following are tips to assist you in preparing for an examination of the return for your plan and trust. 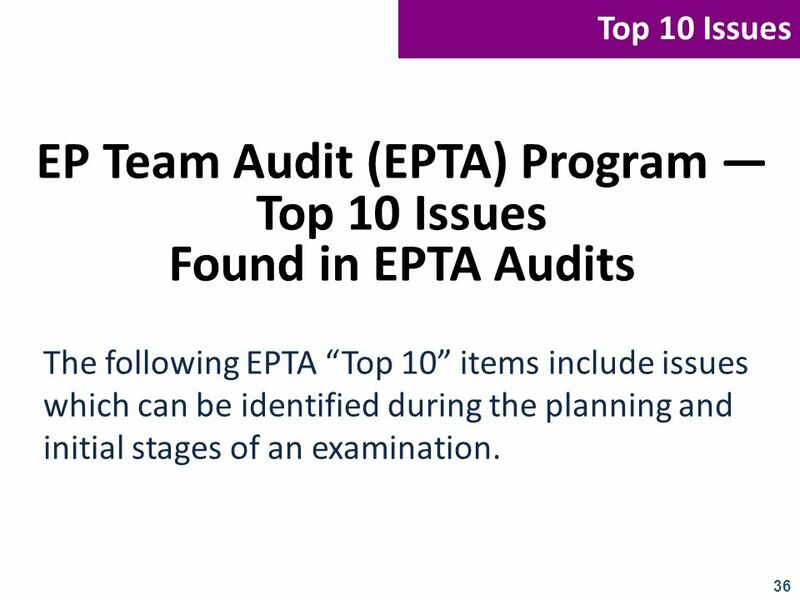 The following EPTA “Top 10” items include issues which can be identified during the planning and initial stages of an examination. 37 Top 10 Issues 1. 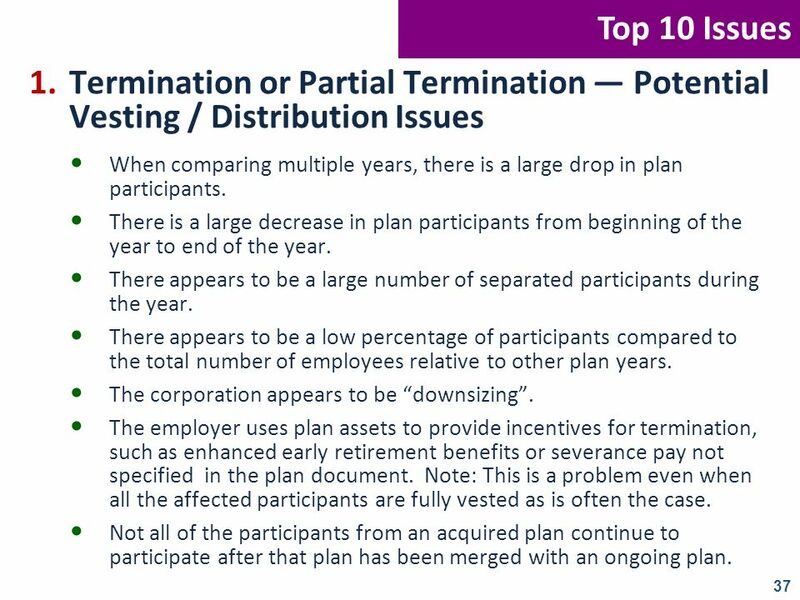 Termination or Partial Termination — Potential Vesting / Distribution Issues When comparing multiple years, there is a large drop in plan participants. There is a large decrease in plan participants from beginning of the year to end of the year. There appears to be a large number of separated participants during the year. There appears to be a low percentage of participants compared to the total number of employees relative to other plan years. The corporation appears to be “downsizing”. 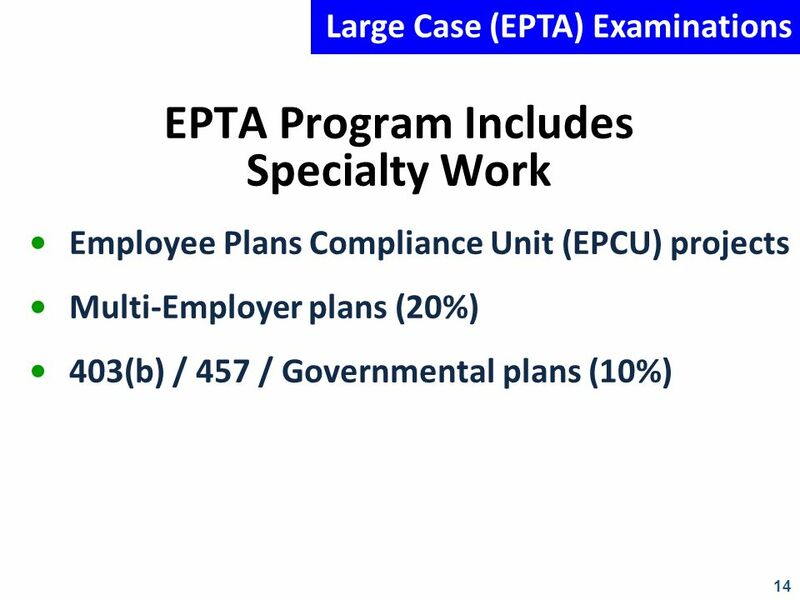 The employer uses plan assets to provide incentives for termination, such as enhanced early retirement benefits or severance pay not specified in the plan document. Note: This is a problem even when all the affected participants are fully vested as is often the case. 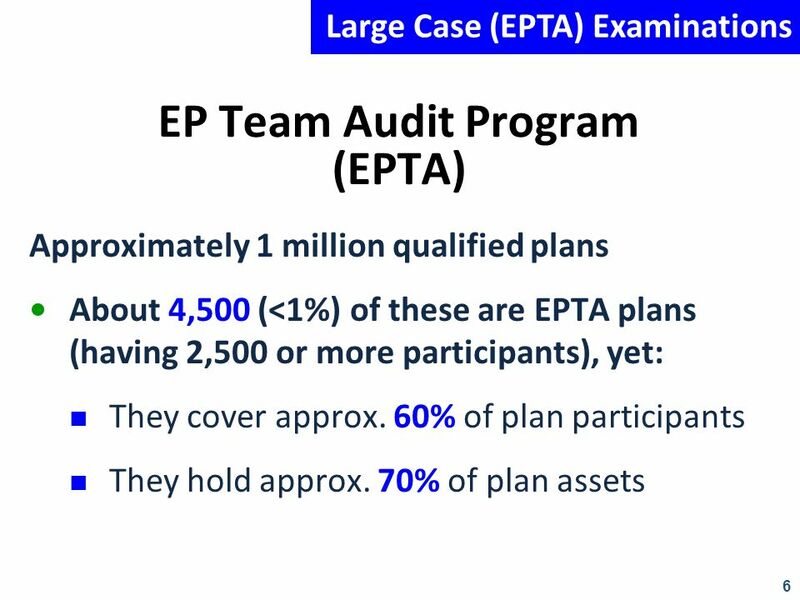 Not all of the participants from an acquired plan continue to participate after that plan has been merged with an ongoing plan. With respect to employer allocations made each pay period, the acquiring employer’s profit sharing allocation may not be made to the trust timely for employees of newly acquired companies because the employees may not yet be part of the centralized payroll system. The acquiring employer may exclude the matching contribution for employees of the newly acquired company. The acquiring employer might fail to offer all optional benefits on distributions of transferred assets from merged plans. The acquiring employer might use incorrect compensation amounts when computing the matching contribution for business units of the newly acquired company. Incorrect matching contributions due to inaccurate participation dates for employees of newly acquired companies. The acquiring employer makes a plan contribution relating to an assumed liability. Such contributions are generally acquisition costs that cannot be deducted by either company. Top 10 Issues 3. 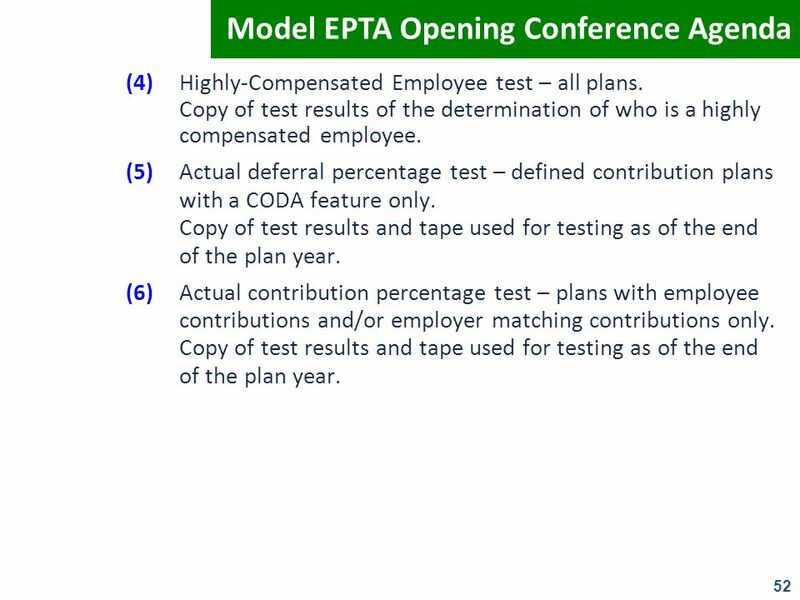 Deferral Percentage Tests If the plan has no limits on HCE deferrals and no matching contributions, examining how the plan meets the ADP test may uncover a process inadequacy. ADP/ACP percentage calculations may be performed incorrectly. ADP/ACP electronic data may be faulty. There could be failures if testing is completed by a third party vendor and there is no oversight by the employer. 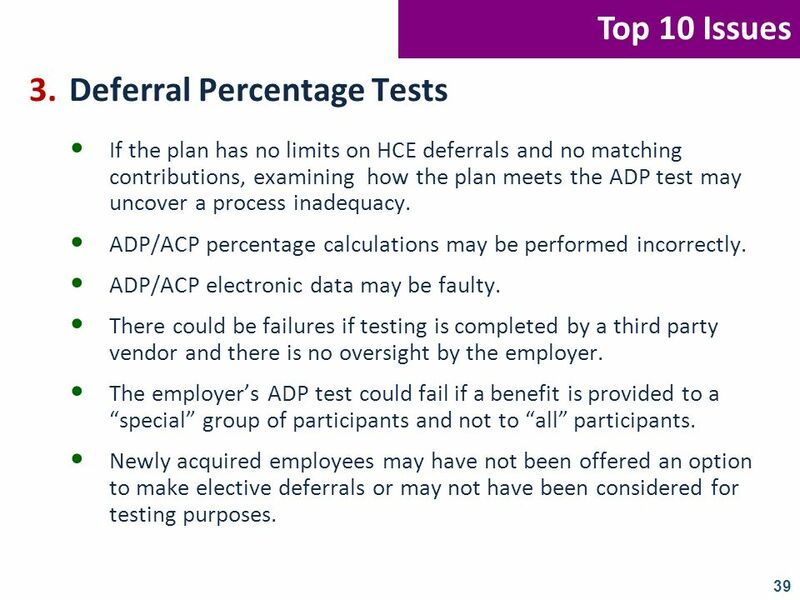 The employer’s ADP test could fail if a benefit is provided to a “special” group of participants and not to “all” participants. Newly acquired employees may have not been offered an option to make elective deferrals or may not have been considered for testing purposes. 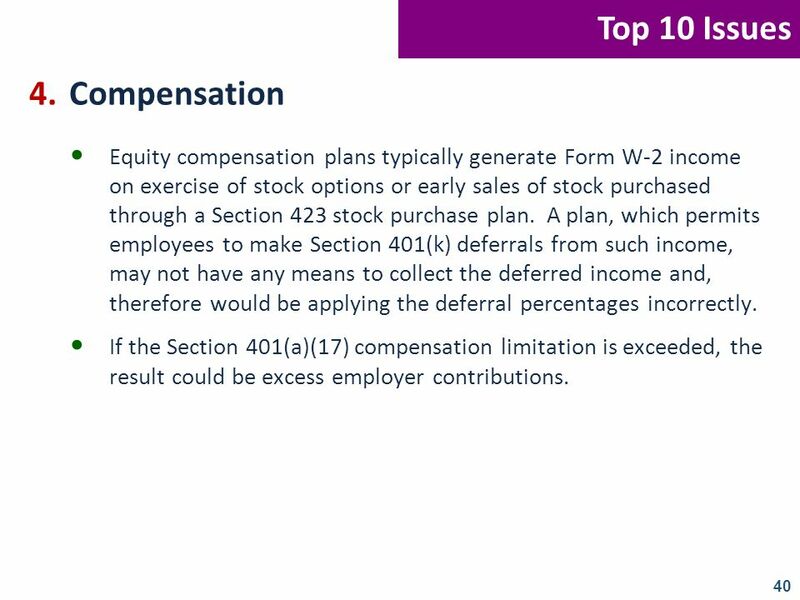 Equity compensation plans typically generate Form W-2 income on exercise of stock options or early sales of stock purchased through a Section 423 stock purchase plan. 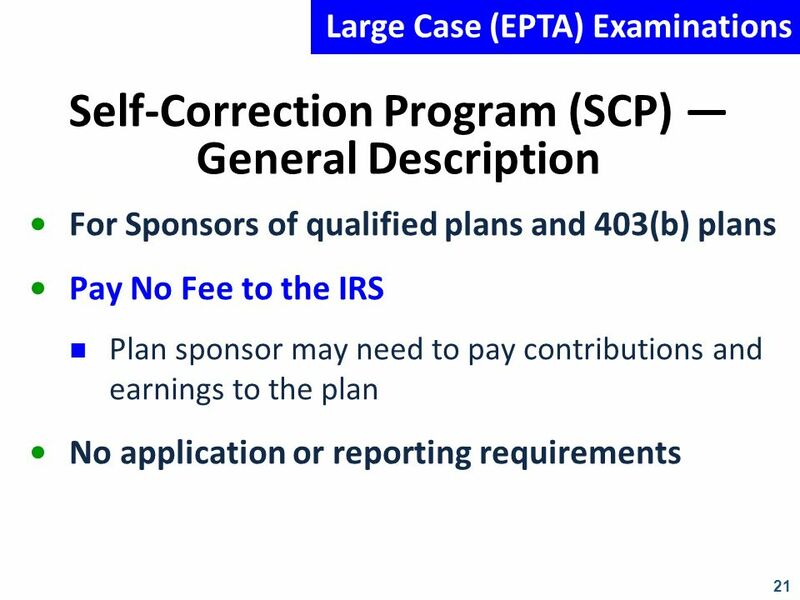 A plan, which permits employees to make Section 401(k) deferrals from such income, may not have any means to collect the deferred income and, therefore would be applying the deferral percentages incorrectly. If the Section 401(a)(17) compensation limitation is exceeded, the result could be excess employer contributions. 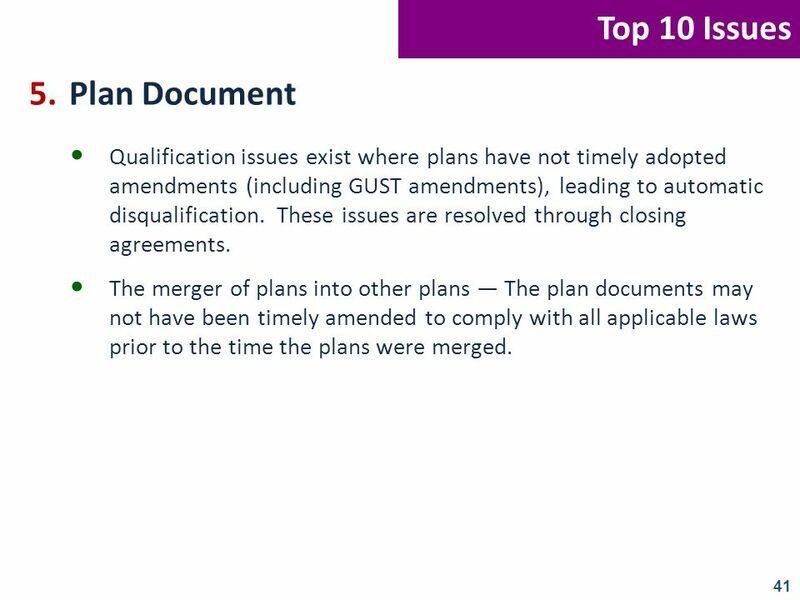 Qualification issues exist where plans have not timely adopted amendments (including GUST amendments), leading to automatic disqualification. These issues are resolved through closing agreements. The merger of plans into other plans — The plan documents may not have been timely amended to comply with all applicable laws prior to the time the plans were merged. 42 Top 10 Issues 6. 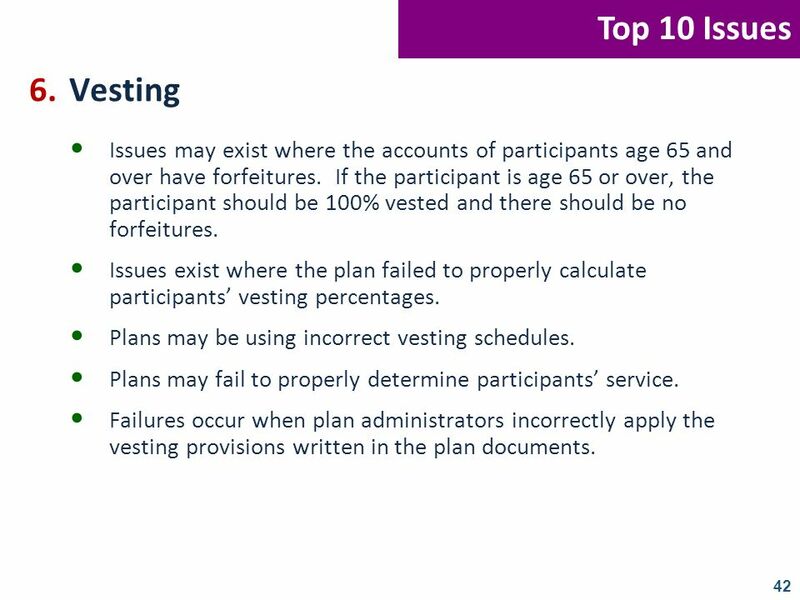 Vesting Issues may exist where the accounts of participants age 65 and over have forfeitures. If the participant is age 65 or over, the participant should be 100% vested and there should be no forfeitures. 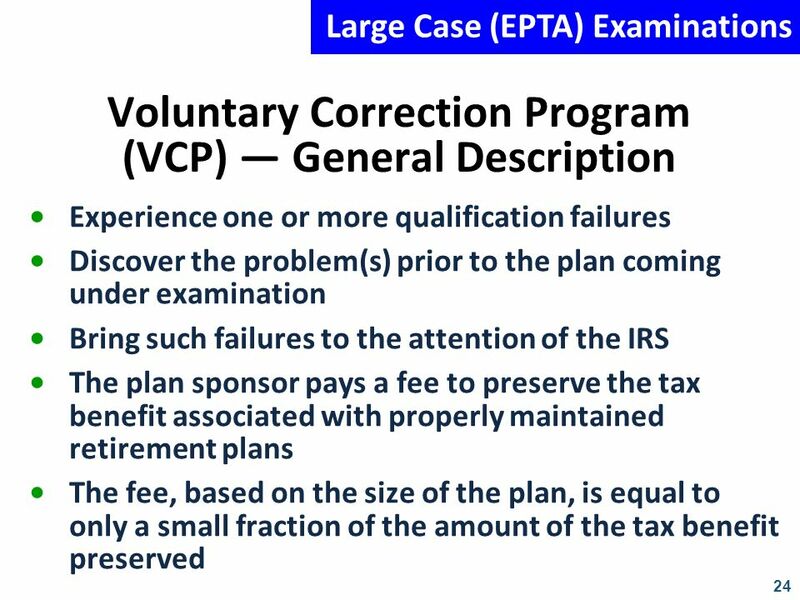 Issues exist where the plan failed to properly calculate participants’ vesting percentages. Plans may be using incorrect vesting schedules. Plans may fail to properly determine participants’ service. 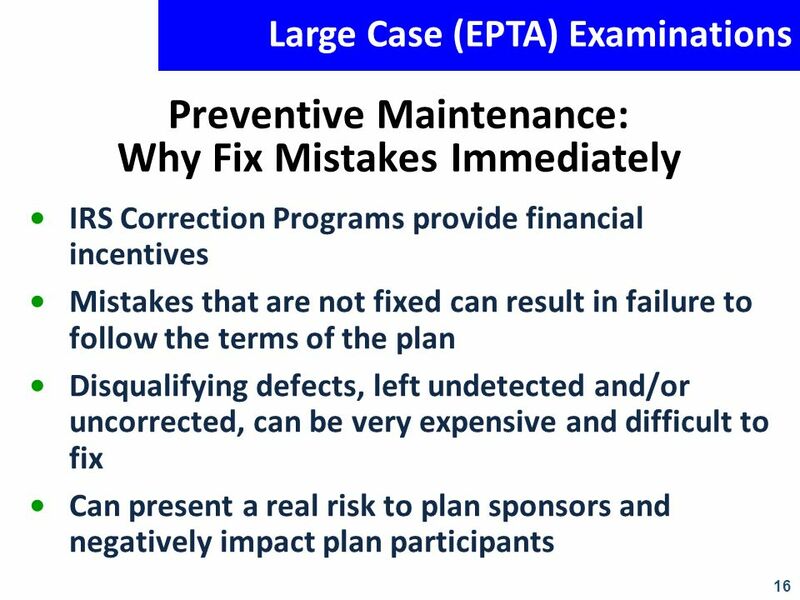 Failures occur when plan administrators incorrectly apply the vesting provisions written in the plan documents. Top 10 Issues 7. Distributions and Loans Large distributions on the income statement relative to plan assets or to a prior or subsequent plan year. 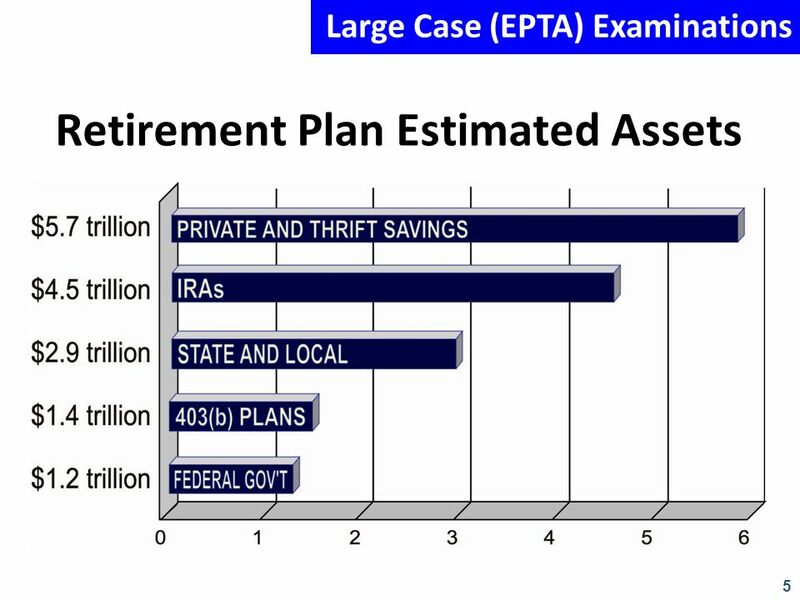 Large distributions payable relative to plan assets or to distributions actually paid out during the plan year. Plans may fail to suspend “salary deferrals” of participants receiving hardship distributions from their accounts as required by I.T. Regulation 1.401(k)-1(d)(2)(iv)(b). 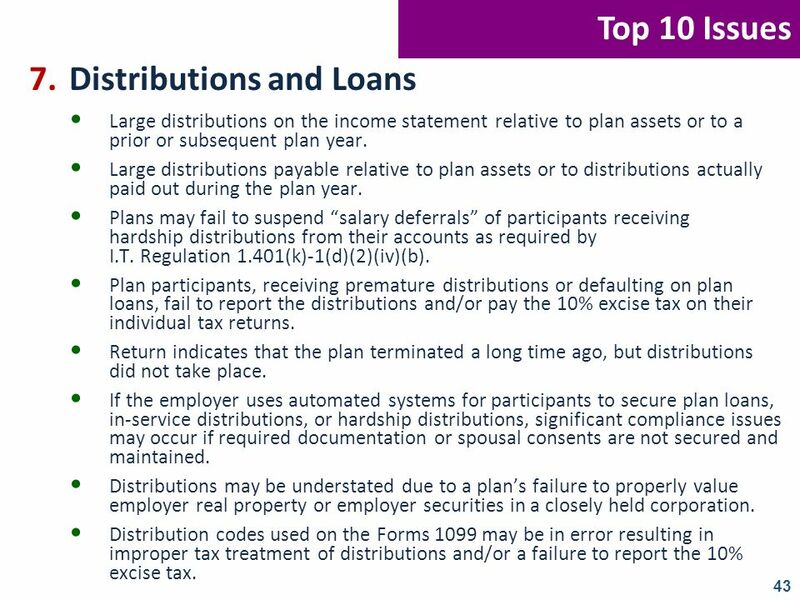 Plan participants, receiving premature distributions or defaulting on plan loans, fail to report the distributions and/or pay the 10% excise tax on their individual tax returns. Return indicates that the plan terminated a long time ago, but distributions did not take place. If the employer uses automated systems for participants to secure plan loans, in-service distributions, or hardship distributions, significant compliance issues may occur if required documentation or spousal consents are not secured and maintained. Distributions may be understated due to a plan’s failure to properly value employer real property or employer securities in a closely held corporation. Distribution codes used on the Forms 1099 may be in error resulting in improper tax treatment of distributions and/or a failure to report the 10% excise tax. 44 Top 10 Issues 8. Assets Large percentage of assets classified as other assets on the balance sheet. Large percentage of assets in one single investment. Large amounts of administrative expenses. Significant misclassifications of assets or liabilities. Significant changes in types of investments from one year to the next based on a comparative analysis of three or more plan years. Existence of relatively large liabilities (other than in a leveraged ESOP). 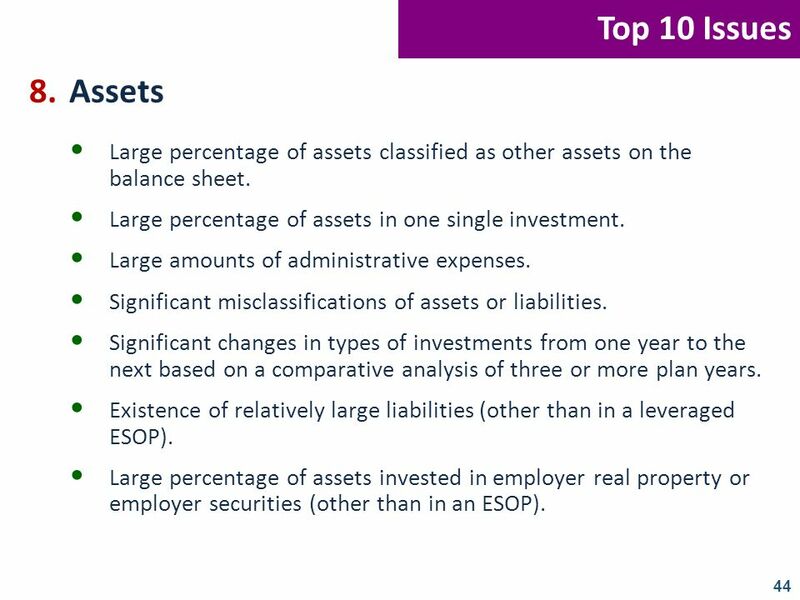 Large percentage of assets invested in employer real property or employer securities (other than in an ESOP). 45 Top 10 Issues 9. Limits Excess deduction taken as a result of the “accrual” of a pension expense with no corresponding Schedule M-1 adjustment. 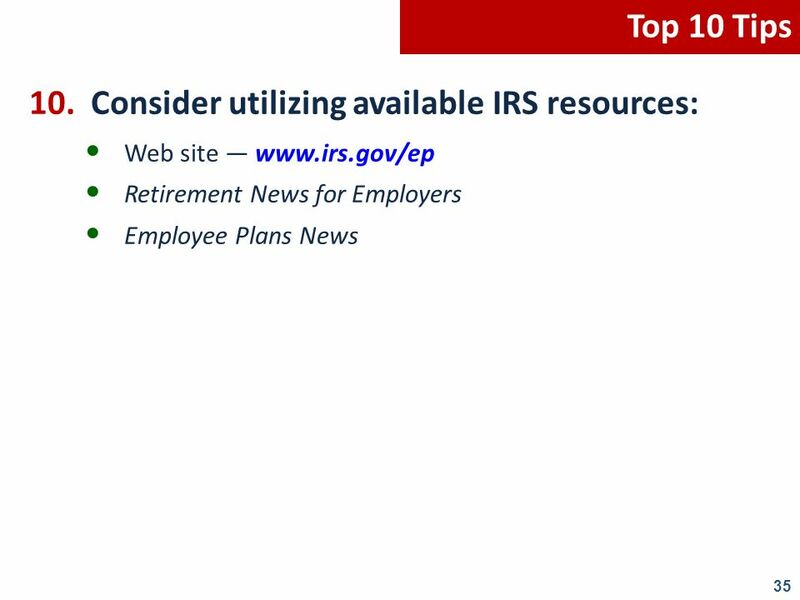 Plan(s) may exceed IRC Section 415 limits when plan participants are participating in more than one plan of the employer and the employer is making annual additions to all plans. 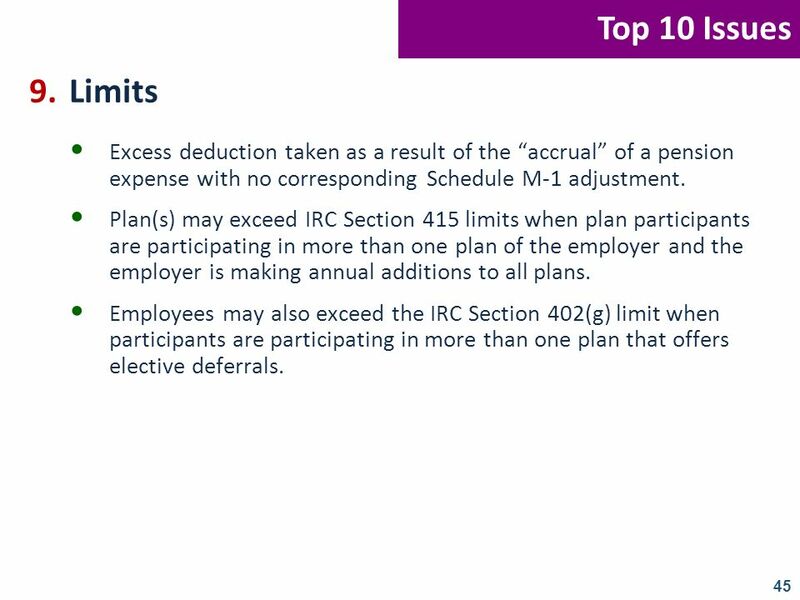 Employees may also exceed the IRC Section 402(g) limit when participants are participating in more than one plan that offers elective deferrals. 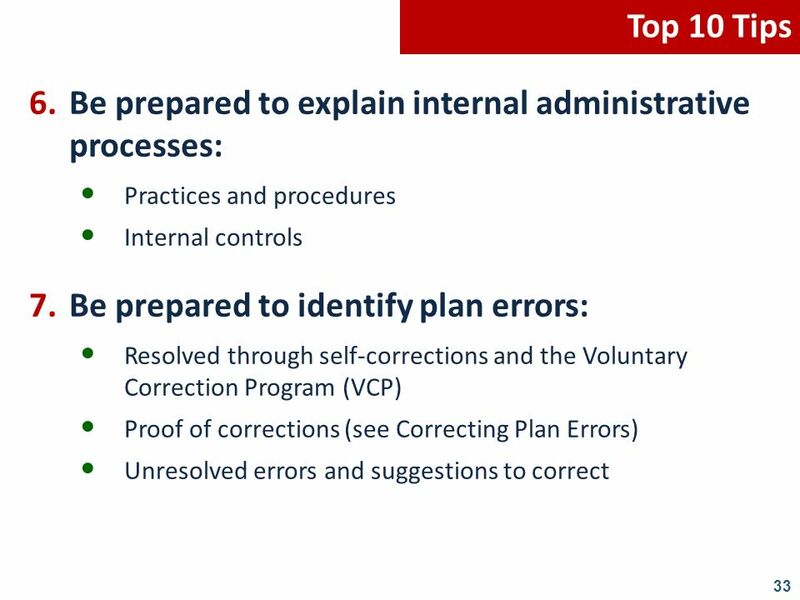 Lack of sufficient internal controls to ensure that data provided to third party record keepers / plan administrators is accurate. 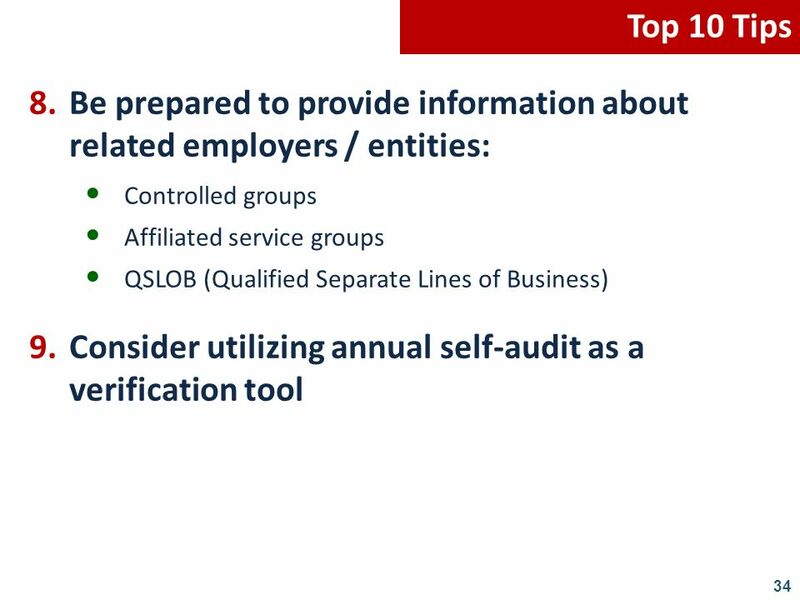 Often the audit reveals that reports and testing prepared by third parties have inaccurate data, such as dates of hire or termination, ages of employees, amount of compensation, etc. Thus the plan administrator is improperly calculating such things as vesting or employer matching allocations. Large corporations with decentralized payroll systems may have problems administering the plan if there are no internal controls to ensure plan provisions are properly applied. 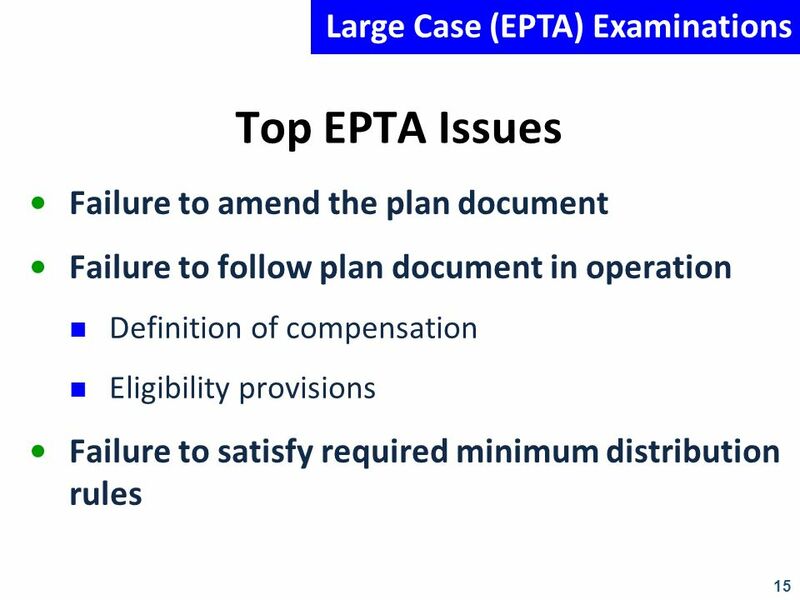 For example, if each subsidiary determines eligibility for plan participation, who is an HCE, or what constitutes “plan compensation”, significant compliance issues may occur in coverage and allocations. 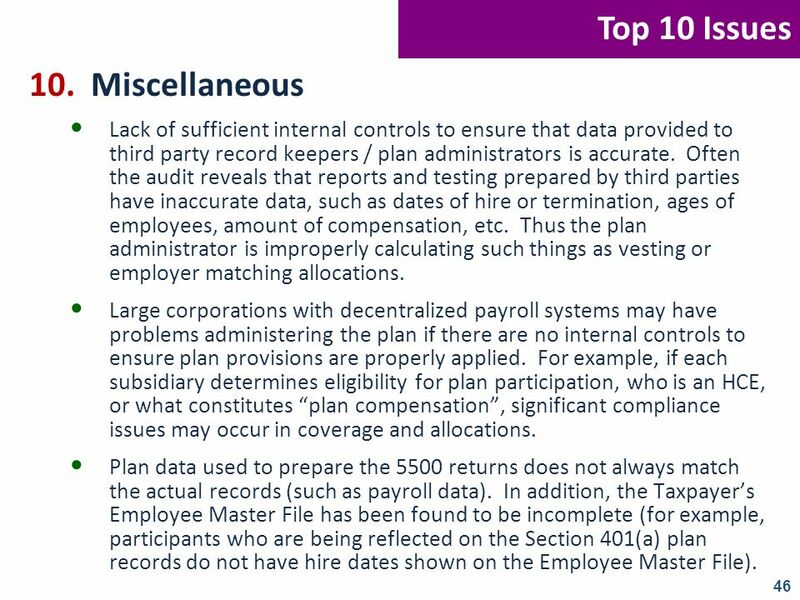 Plan data used to prepare the 5500 returns does not always match the actual records (such as payroll data). 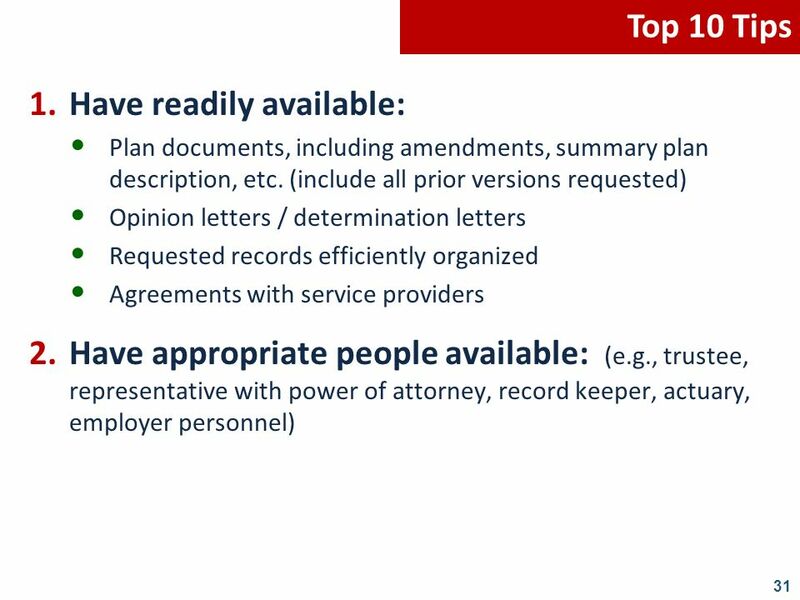 In addition, the Taxpayer’s Employee Master File has been found to be incomplete (for example, participants who are being reflected on the Section 401(a) plan records do not have hire dates shown on the Employee Master File). c.	Other Participants: (1)	Kenneth Oak, Employee Plans Field Actuary (Badge No ) (2)	Sandy Cambridge, EBEO Area Counsel (Badge No ) 2. Plans under audit: a. Profit Sharing and Retirement Plan of XYZ Corporation (Plan 001) b. 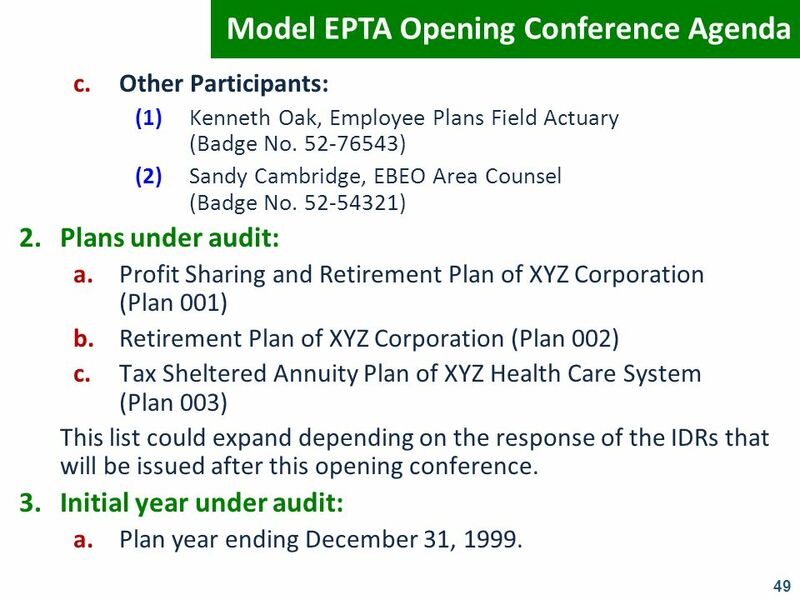 Retirement Plan of XYZ Corporation (Plan 002) c.	Tax Sheltered Annuity Plan of XYZ Health Care System (Plan 003) This list could expand depending on the response of the IDRs that will be issued after this opening conference. 3. Initial year under audit: a. Plan year ending December 31, 1999. 4. Scope of audit and information needed to complete review: a. Plan qualification – all plans. Copy of plan and trust documents, copy of last determination letter and any amendments since last determination letter. b. Eligibility*, participation* and coverage – all plans. Payroll master file or employee census containing all employees who performed an hour of service at any time during the plan year. At a minimum, this information should contain name, social security number, unit, division, etc. number, date of hire, date of birth, date of termination, if any, and date of plan participation for each plan. c.	Vesting – all plans. * Form 1099-R tape or tax registers, cancelled checks and account balance/accrued benefit calculation as of date of termination of employment. 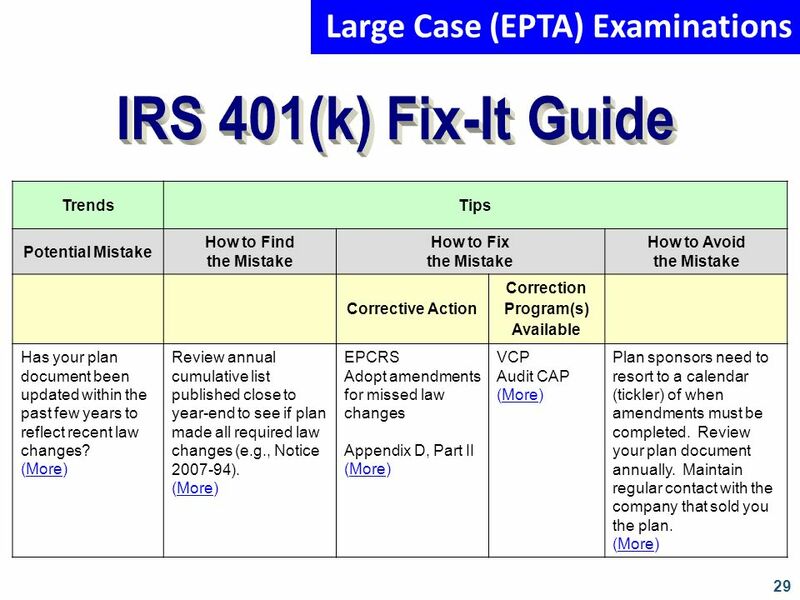 d.	Deduction within IRC Section 404 limits – all plans. Copy of Form 1120 tax return and all appropriate schedules, copy of cancelled checks for all contributions made to the plans, copies of trust statements verifying contributions and reconciliation of deduction. e.	Discrimination: (1)	Cross testing – all plans. Payroll records; Allocation records or participant statements that contain beginning account balance, allocations of employer and employee contributions, allocation of earnings and forfeitures and ending account balance. (2)	Allocations of contributions and earnings – defined contribution and tax sheltered annuity plans. * Allocation records or participant statements that contain beginning account balance, allocations of employer and employee contributions, allocation of earnings and forfeitures and ending account balance. (3)	Accrued benefit calculations – defined benefit plans. 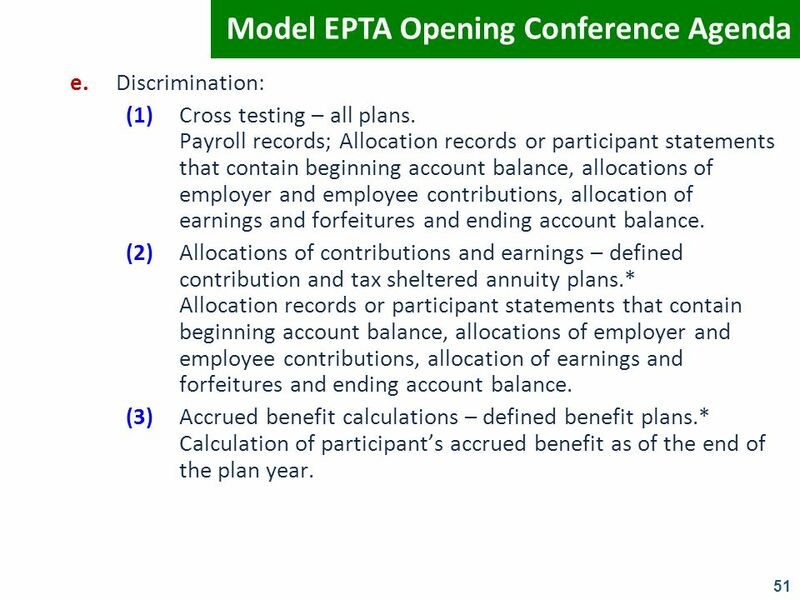 * Calculation of participant’s accrued benefit as of the end of the plan year. 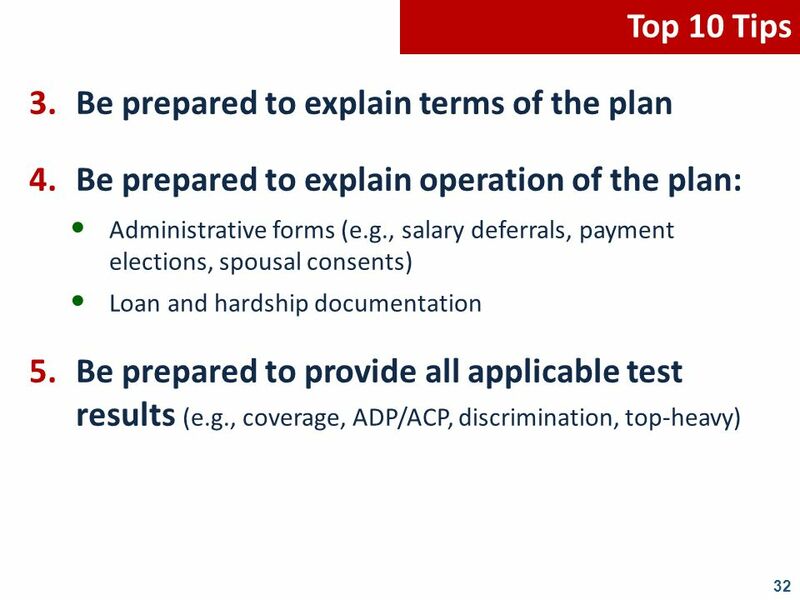 (4)	Highly-Compensated Employee test – all plans. Copy of test results of the determination of who is a highly compensated employee. (5)	Actual deferral percentage test – defined contribution plans with a CODA feature only. Copy of test results and tape used for testing as of the end of the plan year. (6)	Actual contribution percentage test – plans with employee contributions and/or employer matching contributions only. Copy of test results and tape used for testing as of the end of the plan year. f.	Modes of distributions: (1)	Termination of service – all plans. * Copy of cancelled check, copy of participant’s account balance and accrued benefit calculation at termination and at distribution, calculation of vesting service, copy of Form R, consents applicable under IRC Section 411(a)(11) and consents and waivers applicable under IRC Section 417. 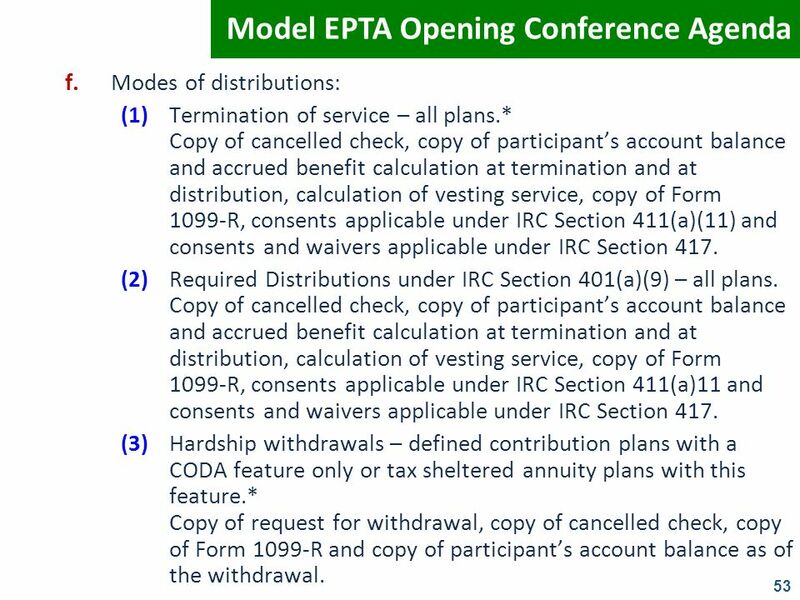 (2)	Required Distributions under IRC Section 401(a)(9) – all plans. Copy of cancelled check, copy of participant’s account balance and accrued benefit calculation at termination and at distribution, calculation of vesting service, copy of Form R, consents applicable under IRC Section 411(a)11 and consents and waivers applicable under IRC Section 417. (3)	Hardship withdrawals – defined contribution plans with a CODA feature only or tax sheltered annuity plans with this feature. * Copy of request for withdrawal, copy of cancelled check, copy of Form 1099-R and copy of participant’s account balance as of the withdrawal. 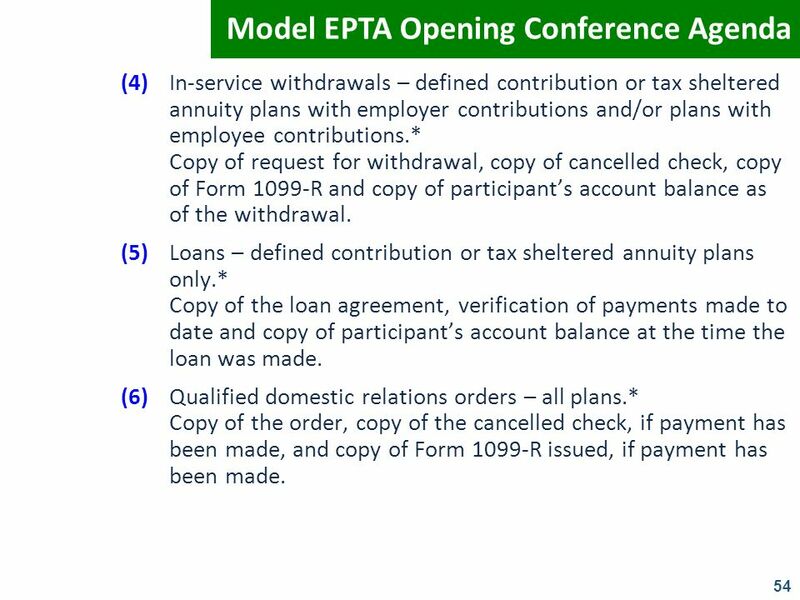 (4)	In-service withdrawals – defined contribution or tax sheltered annuity plans with employer contributions and/or plans with employee contributions. * Copy of request for withdrawal, copy of cancelled check, copy of Form 1099-R and copy of participant’s account balance as of the withdrawal. (5)	Loans – defined contribution or tax sheltered annuity plans only. * Copy of the loan agreement, verification of payments made to date and copy of participant’s account balance at the time the loan was made. (6)	Qualified domestic relations orders – all plans. * Copy of the order, copy of the cancelled check, if payment has been made, and copy of Form 1099-R issued, if payment has been made. g.	Limitations – all plans. (1)	IRC Section 401(a)(30) / 402(g) limitations – plans with employee salary deferrals. Use the Payroll Master File or the ADP/ACP tape for compliance check. 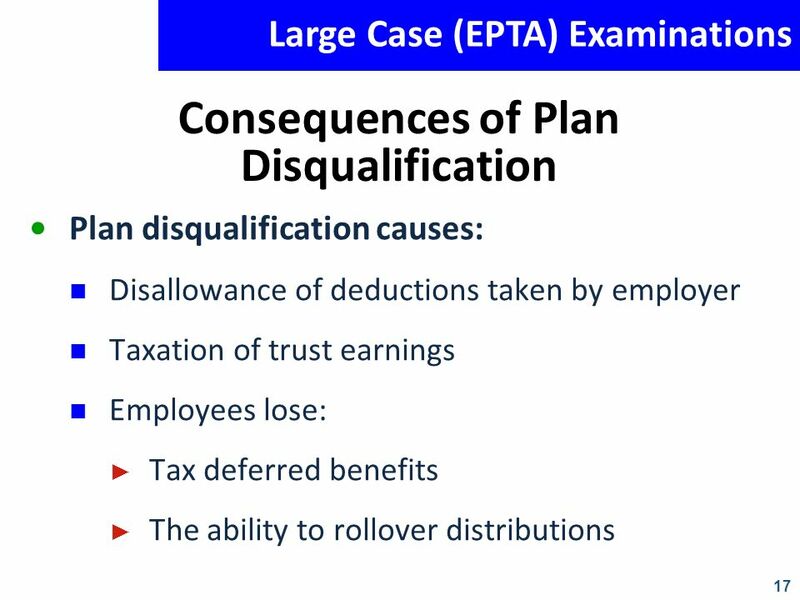 (2)	Contributions in excess of plan limits – plans with employee before-tax and/or after-tax contributions. Use the Payroll Master File or the ADP/ACP tape for compliance check. (3)	Maximum exclusion allowances – all TSAs only. Review calculations done on all participants. (4)	IRC Section 415 limitations – all plans. 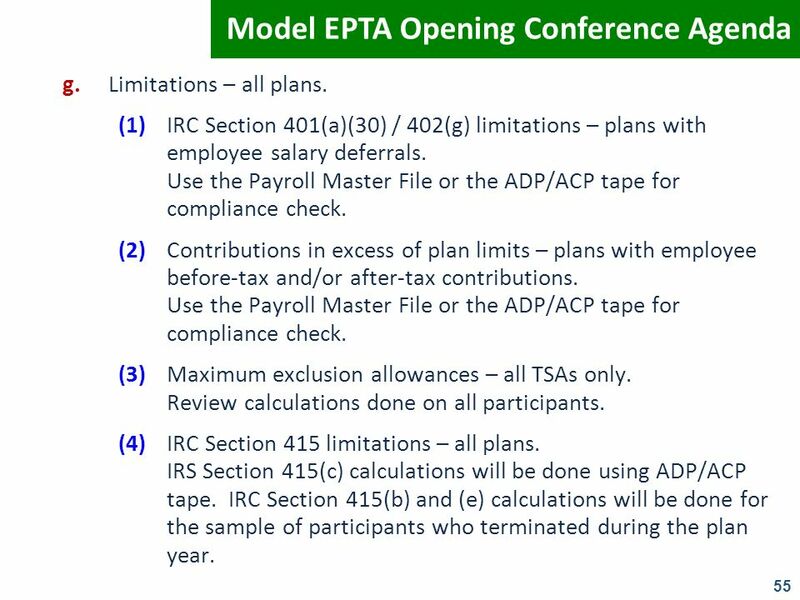 IRS Section 415(c) calculations will be done using ADP/ACP tape. 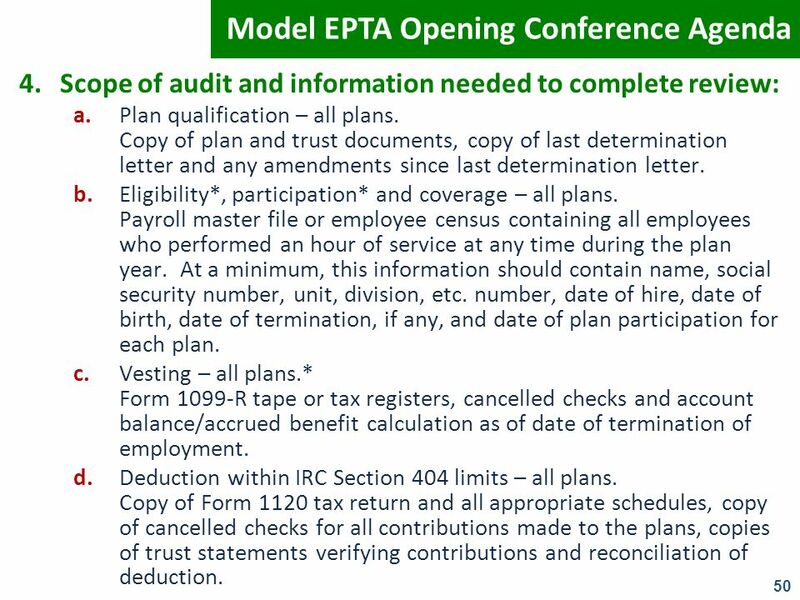 IRC Section 415(b) and (e) calculations will be done for the sample of participants who terminated during the plan year. h.	Minimum funding – money purchase, target benefit and defined benefit plans only. 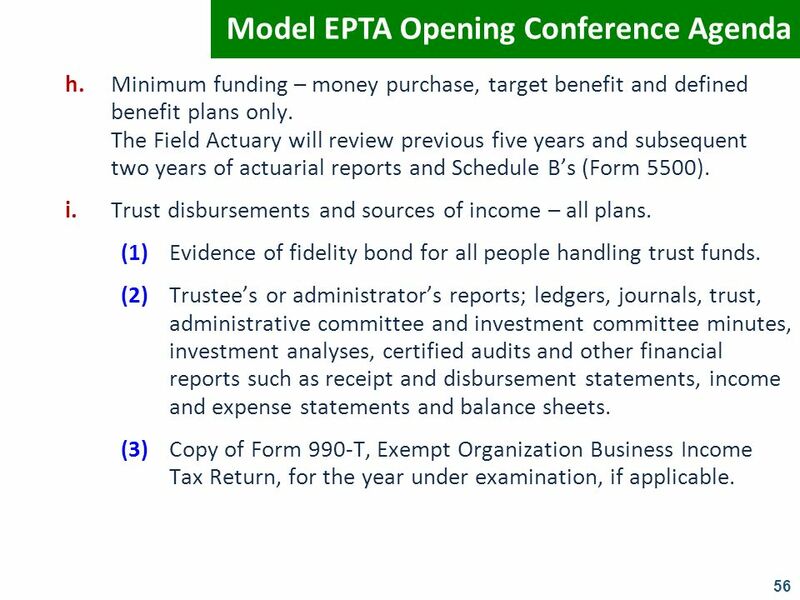 The Field Actuary will review previous five years and subsequent two years of actuarial reports and Schedule B’s (Form 5500). i. Trust disbursements and sources of income – all plans. (1)	Evidence of fidelity bond for all people handling trust funds. (2)	Trustee’s or administrator’s reports; ledgers, journals, trust, administrative committee and investment committee minutes, investment analyses, certified audits and other financial reports such as receipt and disbursement statements, income and expense statements and balance sheets. (3)	Copy of Form 990-T, Exempt Organization Business Income Tax Return, for the year under examination, if applicable. 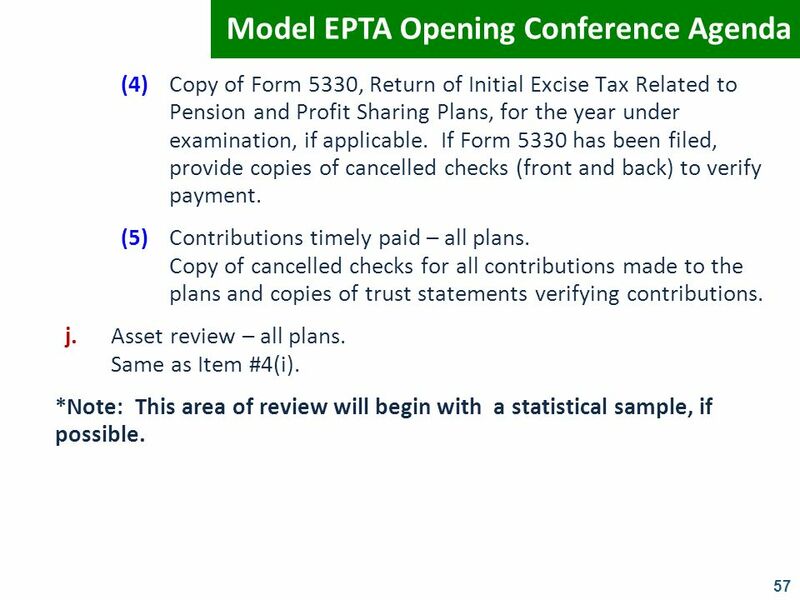 (4)	Copy of Form 5330, Return of Initial Excise Tax Related to Pension and Profit Sharing Plans, for the year under examination, if applicable. If Form 5330 has been filed, provide copies of cancelled checks (front and back) to verify payment. (5)	Contributions timely paid – all plans. Copy of cancelled checks for all contributions made to the plans and copies of trust statements verifying contributions. j. Asset review – all plans. Same as Item #4(i). *Note: This area of review will begin with a statistical sample, if possible. 5. Disclosure: a. Any other audits completed by Department of Labor, other federal or state agencies. b. Any current determination letter requests pending. c.	Operational problems of the plans. 6. Communications Agreement: a. Identify personnel from Employer to be included. 7. 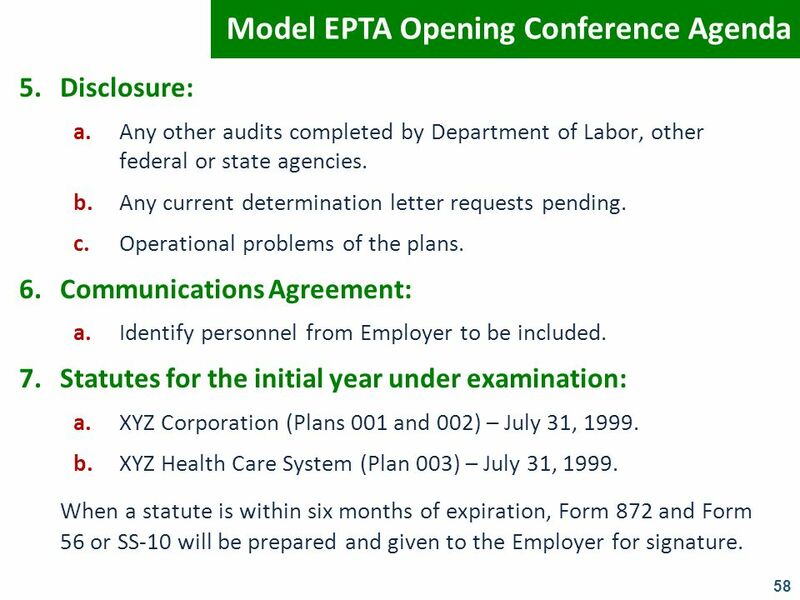 Statutes for the initial year under examination: a.	XYZ Corporation (Plans 001 and 002) – July 31, 1999. b.	XYZ Health Care System (Plan 003) – July 31, 1999. When a statute is within six months of expiration, Form 872 and Form 56 or SS-10 will be prepared and given to the Employer for signature. 8. Facilities: a. Private office space for 3 permanent work stations. b.	Locking storage cabinets. c.	Telephone. d.	Modem lines (analog). e.	Fax Machine. f.	Copier. g.	Building Access. 9. Time Span of Examination: a. Opening – October 2001. b. Closing – June 2003 (estimate only). 10. Information Document Requests (IDRs): a. Issued on Form 4564. b.	Verbal request for information will be followed-up in writing. c.	The turnaround time will be 30 days or less. 11. Proposed Adjustments: a. Issued on Form 5701. b. Response to these adjustments will be 30 days. 12. Interim Meetings with Employer: a. Status meetings will be held as needed. 13. Questions. 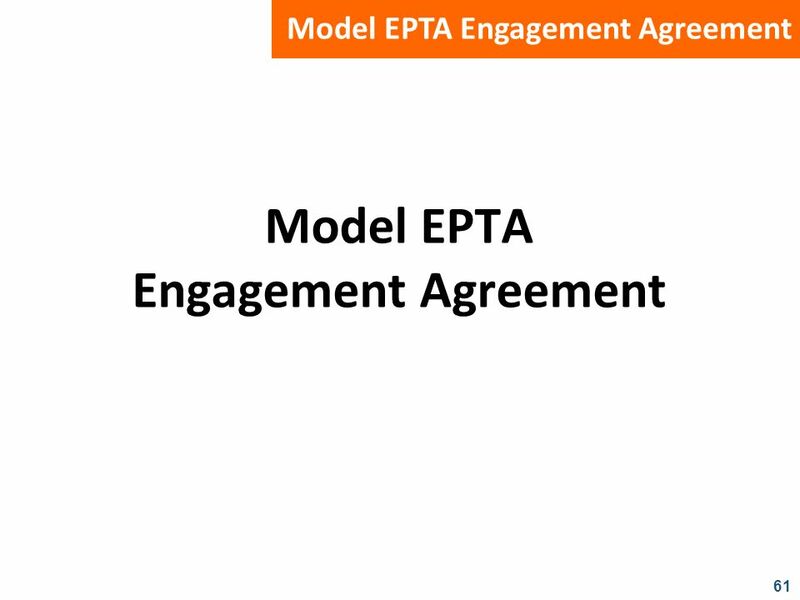 Model EPTA Engagement Agreement EPTA Engagement Agreement Employer EPTA, Inc. Plan Year(s) 200812 City and State Anywhere, USA Employer/EPTA Agreements EPTA Area Mid-Atlantic Communications (Contacts and Disclosure Authorization) Name & Title Entity Telephone Disclosure Code Henry Lodge Senior Vice President Carla Evergreen Director, Human Resources EPTA, Inc. (214) (214) A,C,D B,E Disclosure Codes: A. Designated to discuss Notice of Proposed Adjustments (NOPAs), clarification of facts, etc. B. Designated to receive document requests. C.	Designated to conduct Information Document Request (IDR) meetings, discuss examination progress, etc. D.	Authorized to sign consents to extend the statute of limitations. E.	Primary contact person with the EPTA Team. F.	Authorized to approve or reject any final adjustment, including those proposed under the Employee Plans Compliance Resolution System (EPCRS). G.	Authorized to sign powers of attorney. IRC Section 6103 Provisions Under the provisions of Internal Revenue Code (IRC) 6103, I hereby authorize the Internal Revenue Service (IRS) to discuss the return, return information, and discuss tax issues related to U.S. tax qualified retirement plans for the calendar years ending December 31, 2008 with the above named individuals for the entities identified. 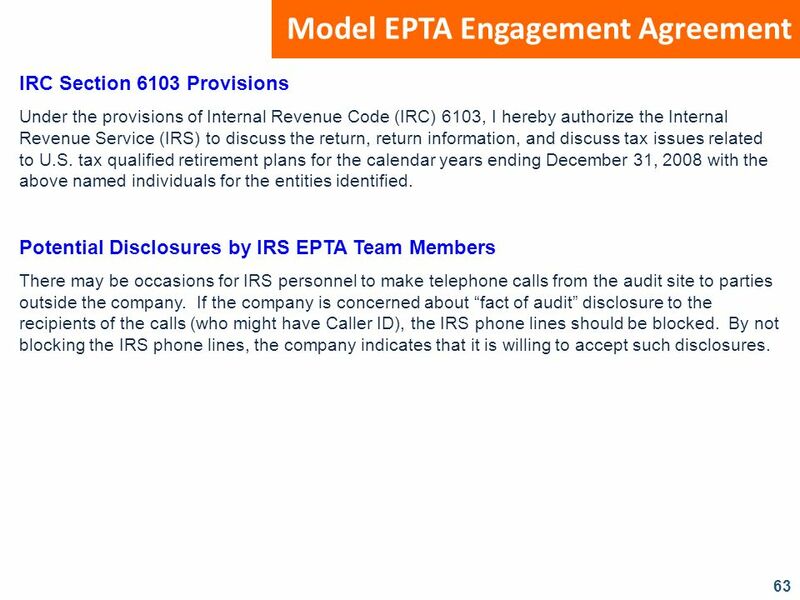 Potential Disclosures by IRS EPTA Team Members There may be occasions for IRS personnel to make telephone calls from the audit site to parties outside the company. If the company is concerned about “fact of audit” disclosure to the recipients of the calls (who might have Caller ID), the IRS phone lines should be blocked. 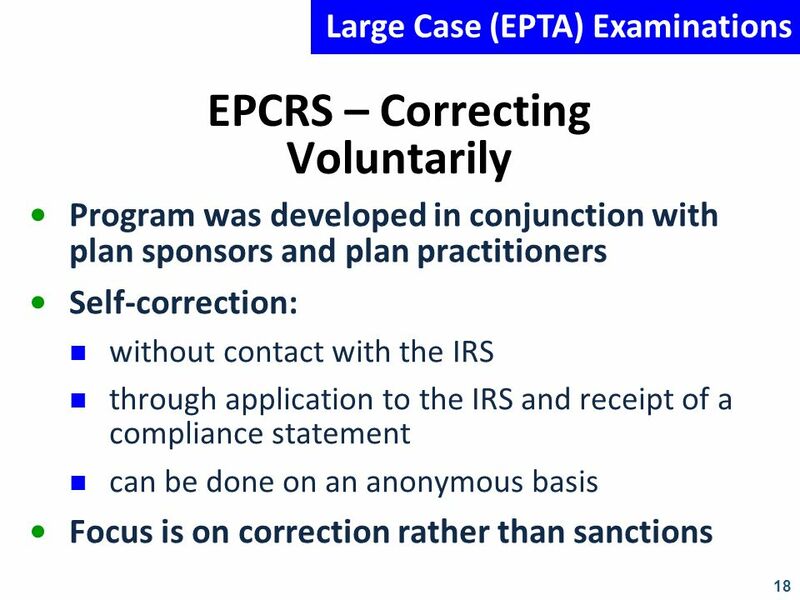 By not blocking the IRS phone lines, the company indicates that it is willing to accept such disclosures. 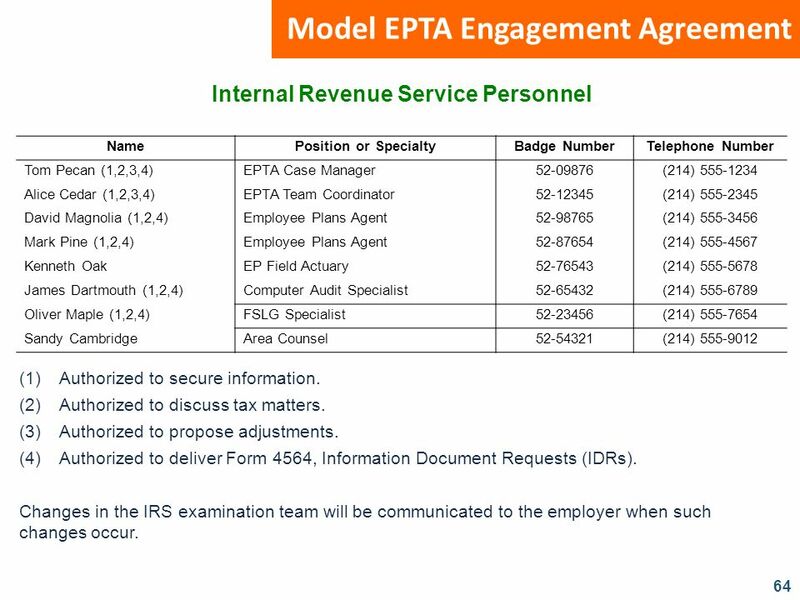 Model EPTA Engagement Agreement Internal Revenue Service Personnel Name Position or Specialty Badge Number Telephone Number Tom Pecan (1,2,3,4) EPTA Case Manager (214) Alice Cedar (1,2,3,4) EPTA Team Coordinator (214) David Magnolia (1,2,4) Employee Plans Agent (214) Mark Pine (1,2,4) (214) Kenneth Oak EP Field Actuary (214) James Dartmouth (1,2,4) Computer Audit Specialist (214) Oliver Maple (1,2,4) FSLG Specialist (214) Sandy Cambridge Area Counsel (214) (1)	Authorized to secure information. (2)	Authorized to discuss tax matters. (3)	Authorized to propose adjustments. (4)	Authorized to deliver Form 4564, Information Document Requests (IDRs). 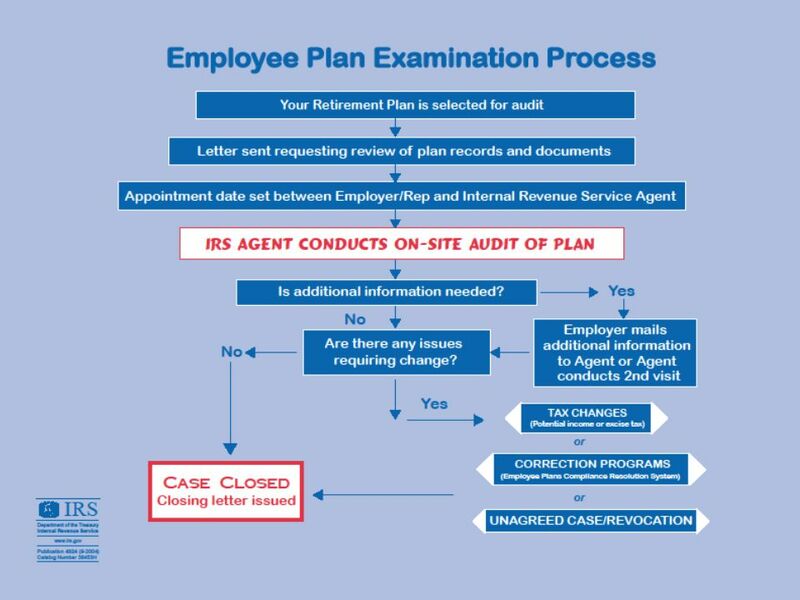 Changes in the IRS examination team will be communicated to the employer when such changes occur. 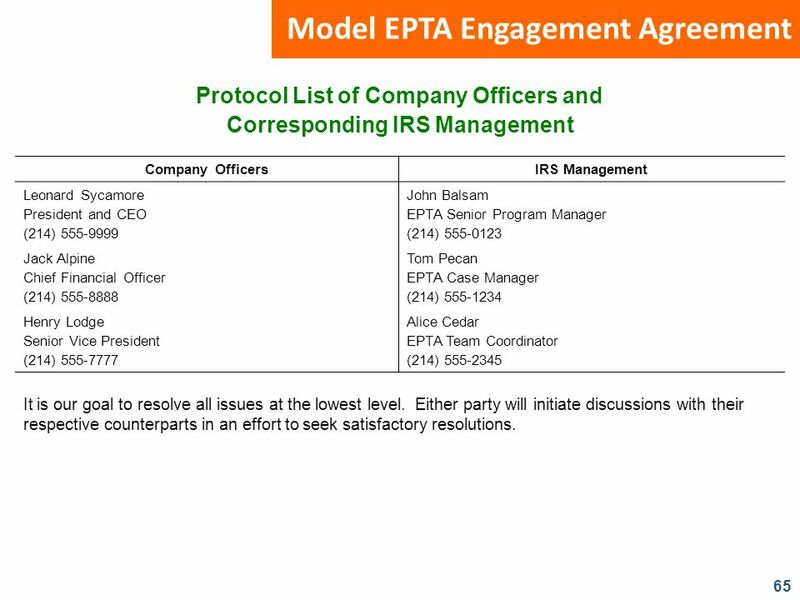 Model EPTA Engagement Agreement Protocol List of Company Officers and Corresponding IRS Management Company Officers IRS Management Leonard Sycamore President and CEO (214) John Balsam EPTA Senior Program Manager (214) Jack Alpine Chief Financial Officer (214) Tom Pecan EPTA Case Manager (214) Henry Lodge Senior Vice President (214) Alice Cedar EPTA Team Coordinator (214) It is our goal to resolve all issues at the lowest level. Either party will initiate discussions with their respective counterparts in an effort to seek satisfactory resolutions. 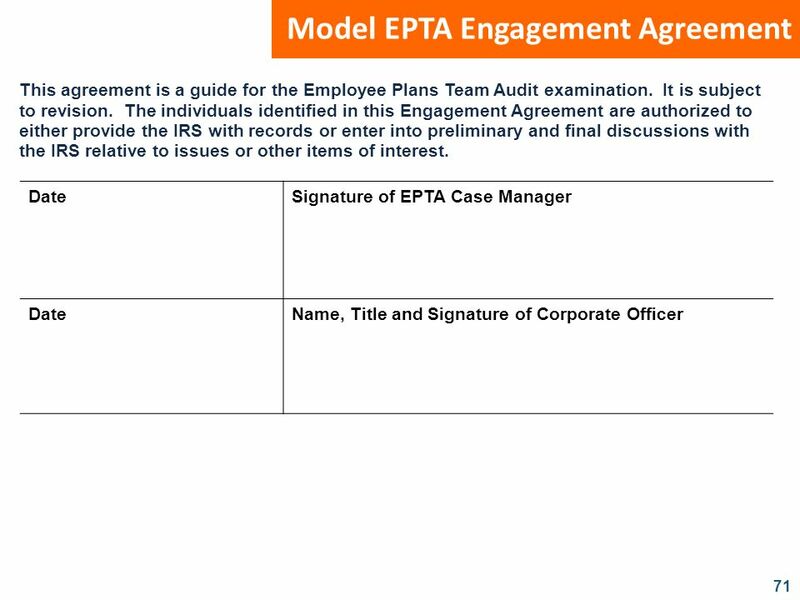 Model EPTA Engagement Agreement Returns / Entities Planned for Examinations Plan Number Plan Name Plan Type EIN 001 EPTA, Inc. Profit Sharing Plan 401(k) 002 EPTA, Inc. Retirement Plan Flexible Compensation Plan for Employees of DB 501 EPTA, Inc. (Cafeteria Plan) 125 Expansion to Other Returns If circumstances warrant the expansion of this examination to other returns or controlled entities beyond those listed above, the employer will be notified. **Individual Returns Individual returns may be inspected and/or examined as circumstances warrant. 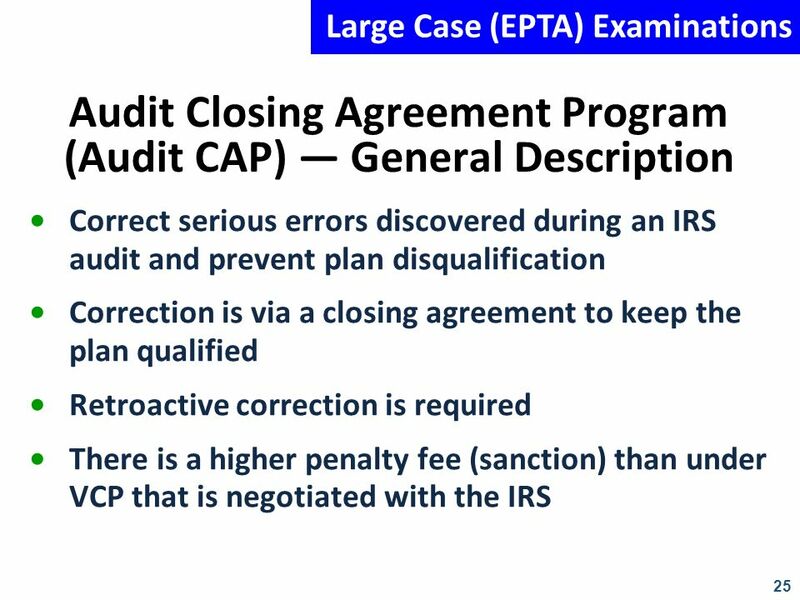 These returns are not covered by this agreement and in order to maintain their privacy and prevent disclosure of audit, each individual will be contacted directly by IRS. 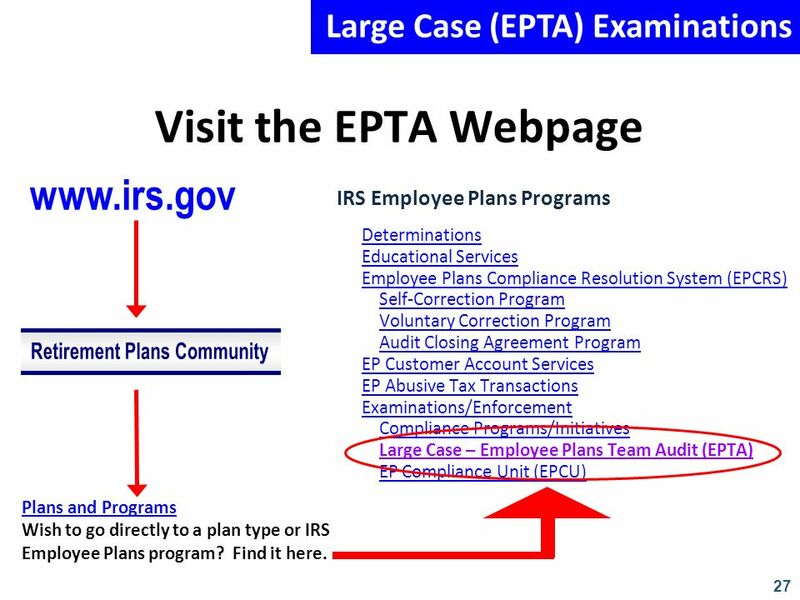 **Contacts by Other IRS Personnel If any IRS employee contacts the employer for the purpose of examining any Federal tax returns, the employer should notify the EPTA Team Coordinator so that audit is coordinated as part of this audit. Other Provisions and Agreements 1. 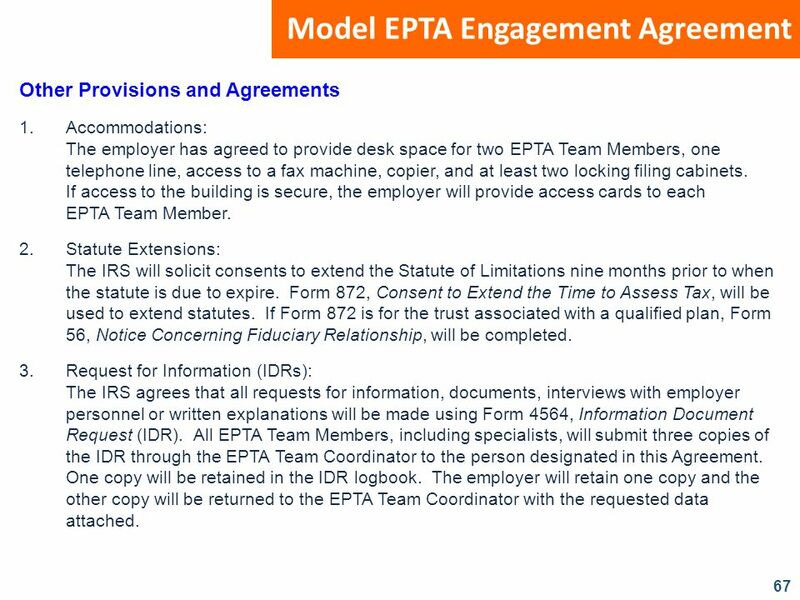 Accommodations: The employer has agreed to provide desk space for two EPTA Team Members, one telephone line, access to a fax machine, copier, and at least two locking filing cabinets. If access to the building is secure, the employer will provide access cards to each EPTA Team Member. 2. Statute Extensions: The IRS will solicit consents to extend the Statute of Limitations nine months prior to when the statute is due to expire. Form 872, Consent to Extend the Time to Assess Tax, will be used to extend statutes. If Form 872 is for the trust associated with a qualified plan, Form 56, Notice Concerning Fiduciary Relationship, will be completed. 3. Request for Information (IDRs): The IRS agrees that all requests for information, documents, interviews with employer personnel or written explanations will be made using Form 4564, Information Document Request (IDR). 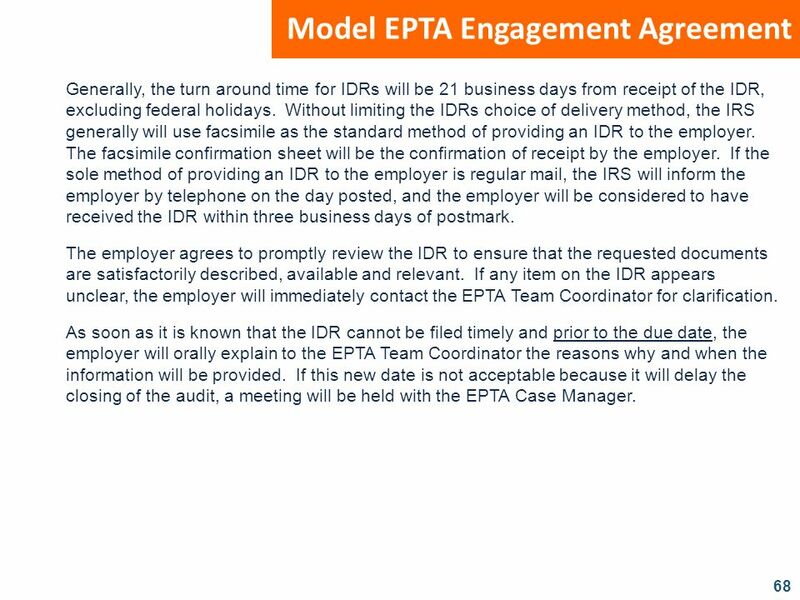 All EPTA Team Members, including specialists, will submit three copies of the IDR through the EPTA Team Coordinator to the person designated in this Agreement. One copy will be retained in the IDR logbook. 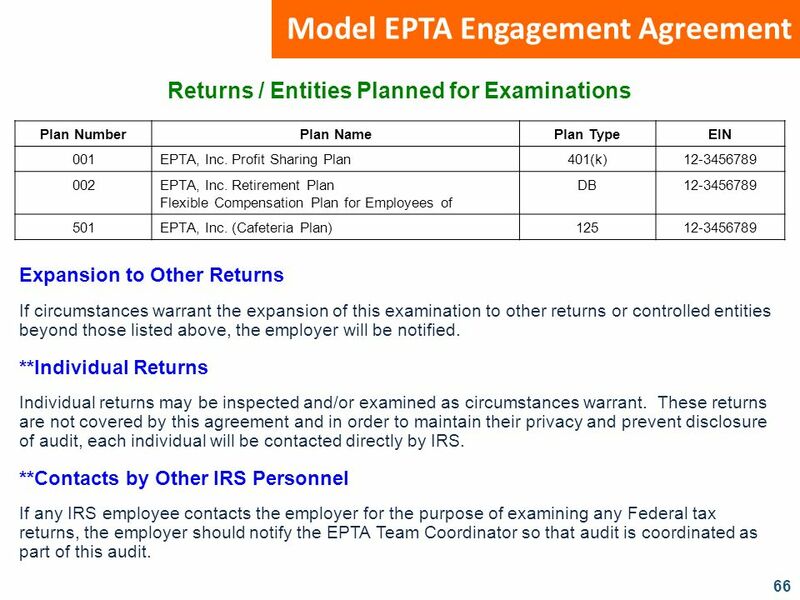 The employer will retain one copy and the other copy will be returned to the EPTA Team Coordinator with the requested data attached. Generally, the turn around time for IDRs will be 21 business days from receipt of the IDR, excluding federal holidays. 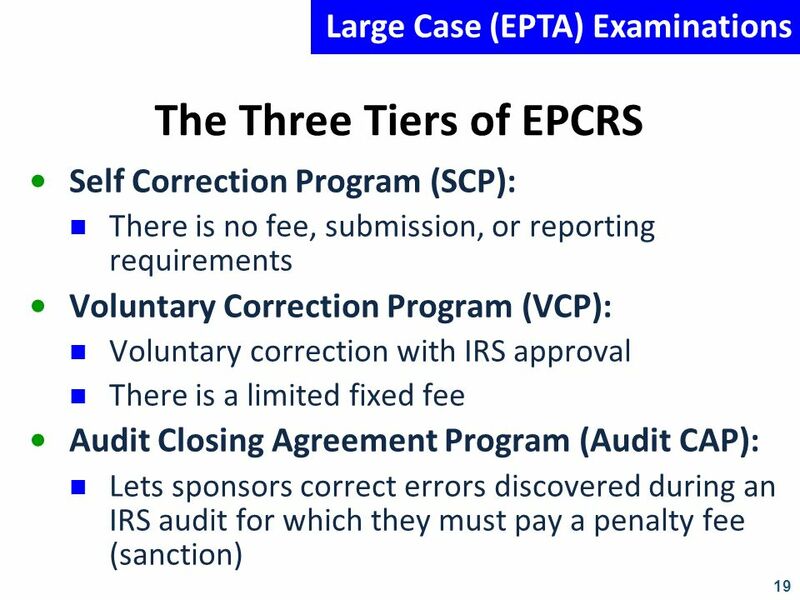 Without limiting the IDRs choice of delivery method, the IRS generally will use facsimile as the standard method of providing an IDR to the employer. The facsimile confirmation sheet will be the confirmation of receipt by the employer. If the sole method of providing an IDR to the employer is regular mail, the IRS will inform the employer by telephone on the day posted, and the employer will be considered to have received the IDR within three business days of postmark. The employer agrees to promptly review the IDR to ensure that the requested documents are satisfactorily described, available and relevant. If any item on the IDR appears unclear, the employer will immediately contact the EPTA Team Coordinator for clarification. As soon as it is known that the IDR cannot be filed timely and prior to the due date, the employer will orally explain to the EPTA Team Coordinator the reasons why and when the information will be provided. 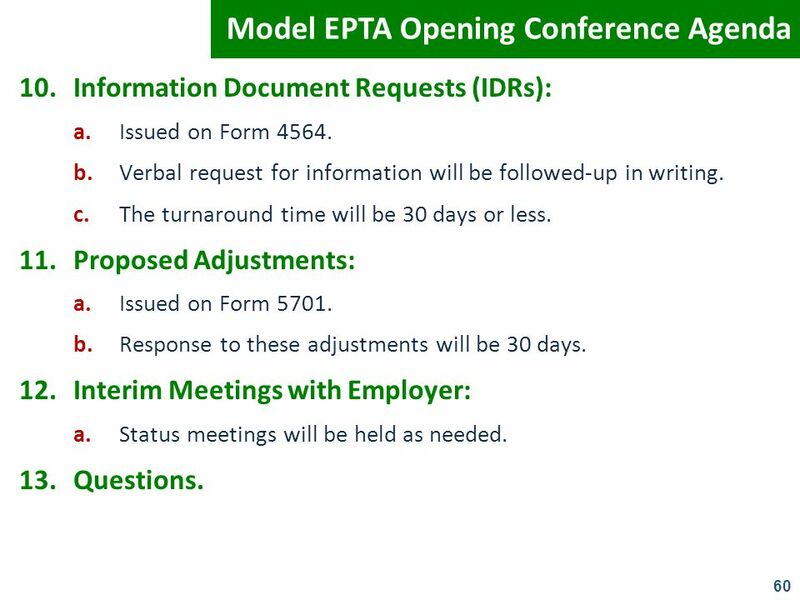 If this new date is not acceptable because it will delay the closing of the audit, a meeting will be held with the EPTA Case Manager. 4. Notice of Proposed Adjustments: Form 5701, Notice of Proposed Adjustment (NOPA), will be used by the IRS to formally notify the employer of issues being raised during the examination. Potential issues will be first informally discussed with the personnel designated in this agreement. Every attempt to reach an agreement on the facts should be made during the IDR stage. 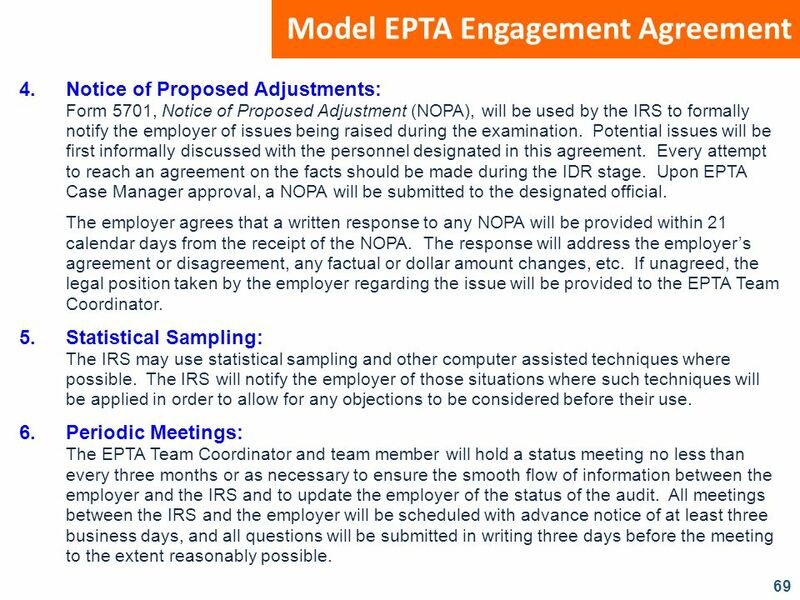 Upon EPTA Case Manager approval, a NOPA will be submitted to the designated official. The employer agrees that a written response to any NOPA will be provided within 21 calendar days from the receipt of the NOPA. The response will address the employer’s agreement or disagreement, any factual or dollar amount changes, etc. 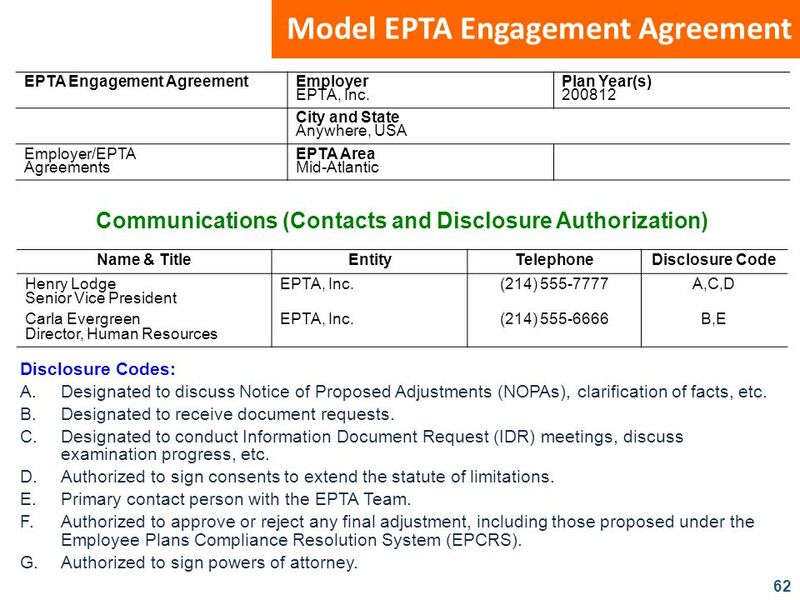 If unagreed, the legal position taken by the employer regarding the issue will be provided to the EPTA Team Coordinator. 5. Statistical Sampling: The IRS may use statistical sampling and other computer assisted techniques where possible. 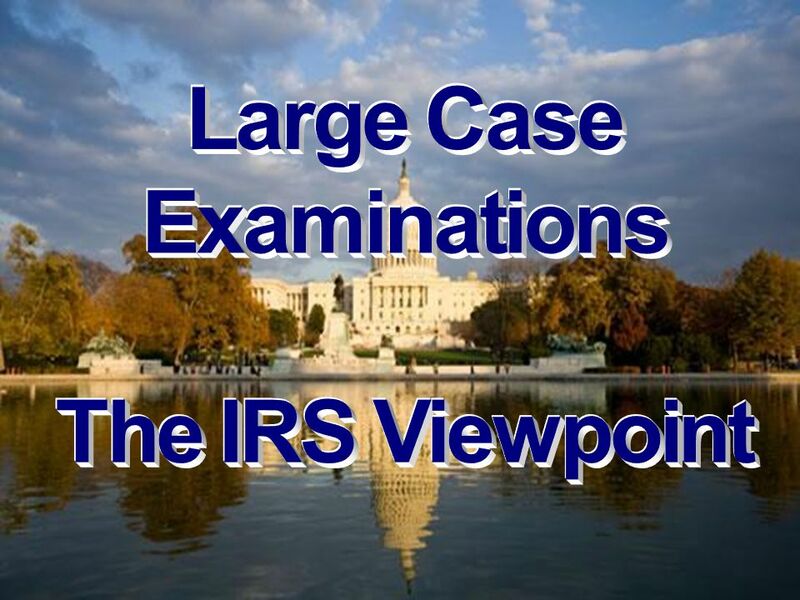 The IRS will notify the employer of those situations where such techniques will be applied in order to allow for any objections to be considered before their use. 6. 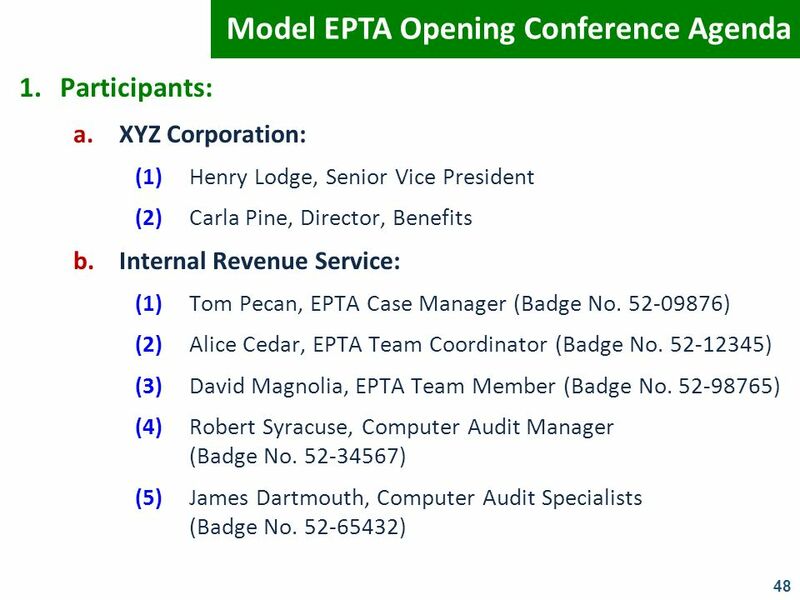 Periodic Meetings: The EPTA Team Coordinator and team member will hold a status meeting no less than every three months or as necessary to ensure the smooth flow of information between the employer and the IRS and to update the employer of the status of the audit. All meetings between the IRS and the employer will be scheduled with advance notice of at least three business days, and all questions will be submitted in writing three days before the meeting to the extent reasonably possible. 7. *One Stop Customer Service: It is the policy of the EPTA program to provide one stop customer service to the EPTA employers. 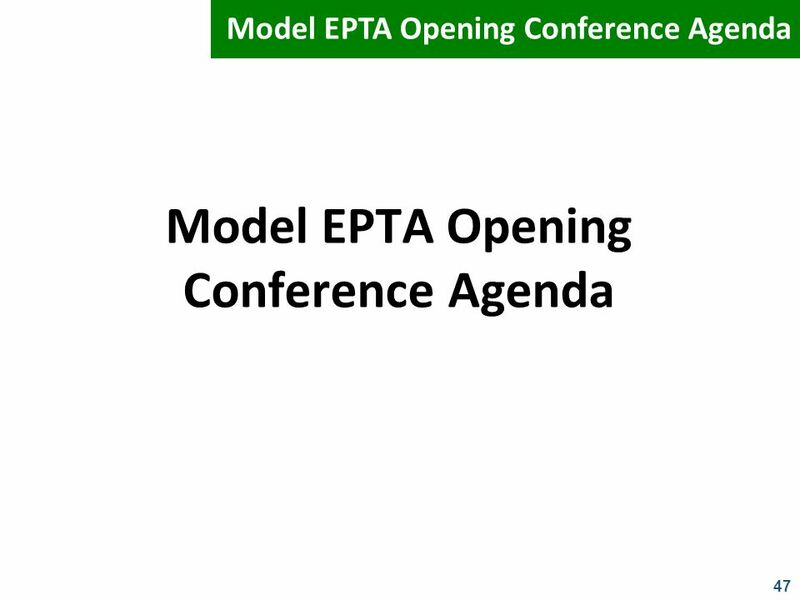 All requests for help or assistance should be routed through the EPTA Team Coordinator. 8. 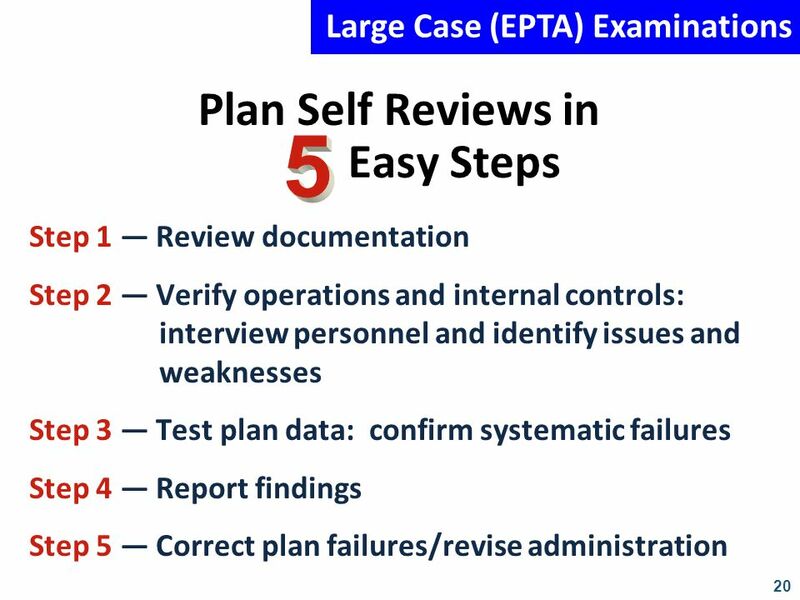 Post-Examination Critique: At the end of the examination, a meeting will be scheduled to discuss the effectiveness of the completed audit and to consider ways to improve the EPTA process. 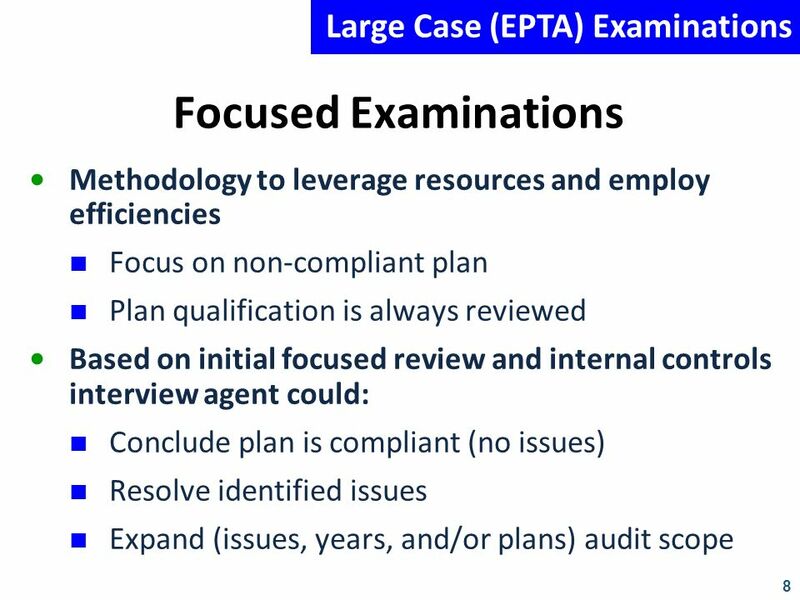 This is the employer’s opportunity to raise any concerns with the EPTA Case Manager about how the audit has been conducted and any recommendations for future audits. IRS officials such as the Area Manager and/or the EPTA National Coordinator may attend this meeting. 9. Responsibilities: It is the duty of the EPTA Team Coordinator to coordinate the day-to-day activities of the examination, to work directly with the designated company officials and to carry out the policies and procedures set forth in this agreement. 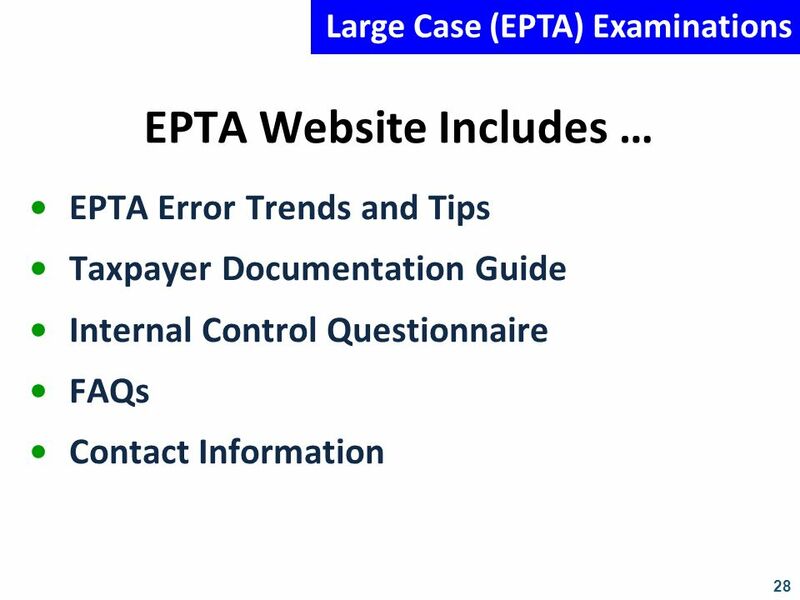 The EPTA case Manager will be available and open to any questions or concerns that arise during the course of the examination, as well as to provide any required assistance to the audit team or the employer as needed. Estimated Completion Date At the beginning of this audit, the estimated completion date (ECD) is June 30, The estimated completion date may be adjusted as the examination is developed. 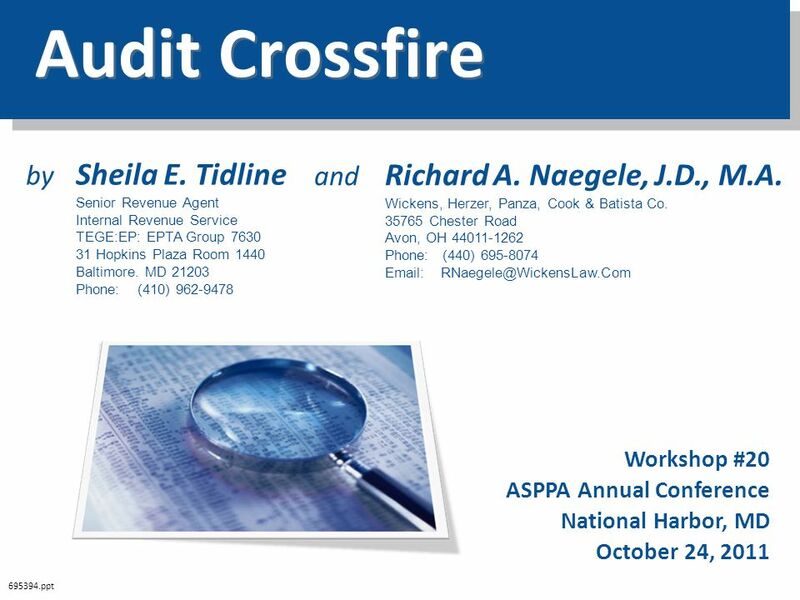 Download ppt "Audit Crossfire by Sheila E. Tidline"
2012 PROXY OUTLOOK Stephen L. Brown, Director of Corporate Governance & Associate General Counsel TIAA-CREF November 3, 2011. Journey Toward Financial Freedom Flora Digby And Sheila M. Wilkinson-Sanders Economic Development Chairs Phase II – Plan In Motion Income Taxes & Obama. by	Richard A. Naegele, J.D., M.A. FEDERAL TAX ISSUES John R. McQueen, Esq. Tax-Exempt Bonds as a Financing Tool for Construction of New College and University Facilities June 28, 2007. FEDERAL TAX ISSUES John R. McQueen, Esq. Tax-Exempt Bonds as a Financing Tool for Construction of New College and University Facilities April 18, 2008. TENNESSEE REVENUE ESTIMATES FISCAL YEARS AND Presentation to the State Funding Board Fiscal Review Committee Staff March 24, 2010. MONTGOMERY COUNTY, MD: Development Through Partnerships Maryland Association of Counties Public Private Partnerships Symposium July 12, 2011. TAXES & EDUCATIONAL CREDITS FOR STUDENTS & PARENTS Presented By Joseph R. Maggitti Sr., MBA James Hudson, CPA, MBA Harold Singletary. ROBERT CORDASCO, CPA JANUARY, Tax Update. Lecture 20 Introduction to Qualified Retirement Plans What does it mean to be qualified? Taxation Management objectives in pension plan design Government’s. TOTAL POPULATION MANAGEMENT MASI WINTER CONFERENCE FEBRUARY 21,2013. Lecture 29 Individual Retirement Arrangements History of IRAs Traditional IRAs –Definition –Contributions –Rollovers –Withdrawals Roth IRAs Education IRAs. Long Term Care, Family Caregiving and the Law of Succession Part One Josephine Gittler The Aging Population, Alzheimer’s and Other Dementias: Law and Public. Retirement Systems and Their Contributions to Capital Markets … The 401(k) Experience in the U.S. John J. Palmer. 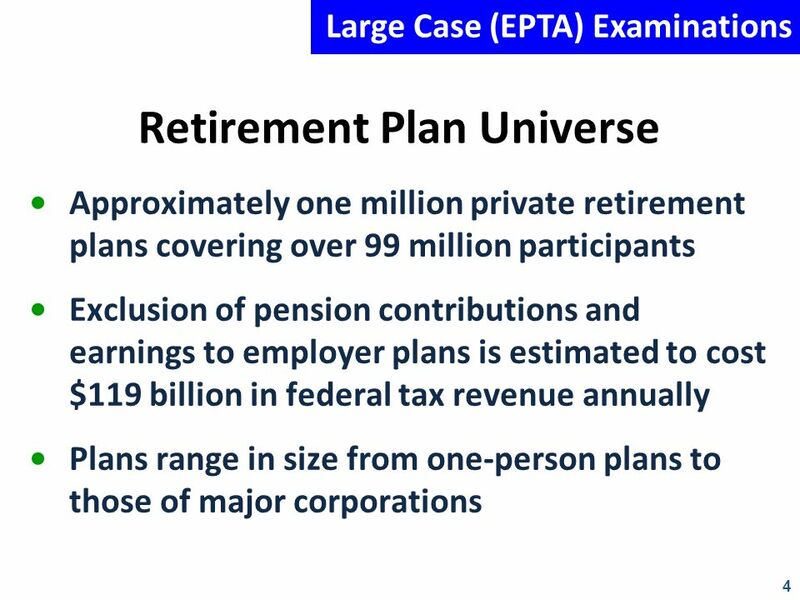 Covered Employer Training Program Module One Introduction to the Retirement Systems.